As I see it, Aquaman is a very underrated superhero. Sure, his abilities amount to little more than telepathy and the usual suite of enhanced physiology while in the water, but that’s still cause for envy from someone who struggles to stay afloat in the water. The funny thing about Aquaman is that because he’s so widely ridiculed, he’s become more well-known than most other B-grade Marvel heroes. 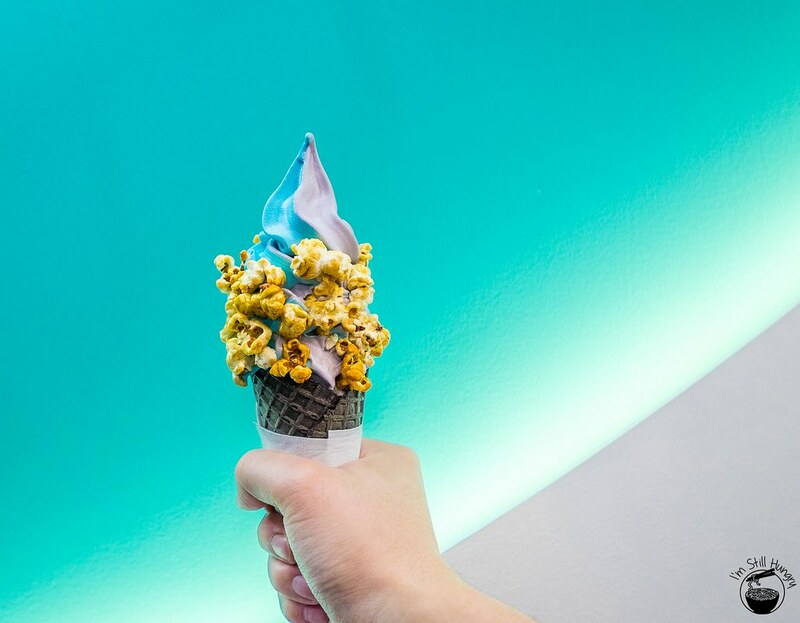 Aqua S is like an improved Aquaman – as standout as ever thanks to its distinct hue, possesses superpowers , and best of all, it’s famous because it’s actually a pretty sweet-tasting soft serve. 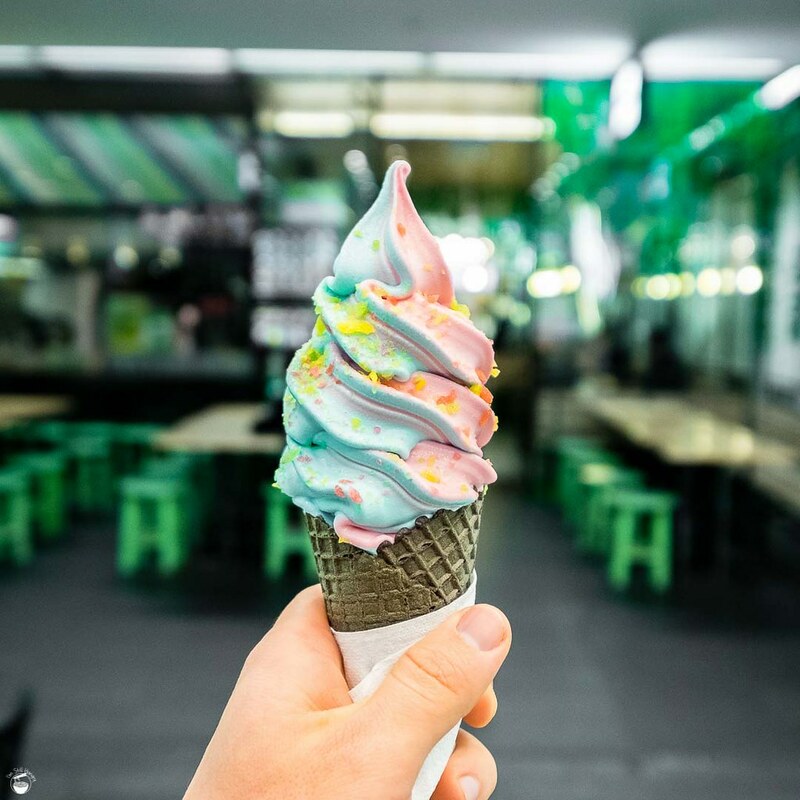 No wonder this is currently the most Instagrammed food in Sydney at the moment. On the one hand: MINION FLAVOUR! On the other hand – it’s actually pineapple. That said, the last time we got a yellow-coloured Aqua S was all the way back during Update 2 – the mandarin flavour. So yeah, it’s been awhile. Yellow is such a refreshing change from the bevy of browns, greys and pinks that I can’t help but choose this as my order – despite it being the dairy-free option. 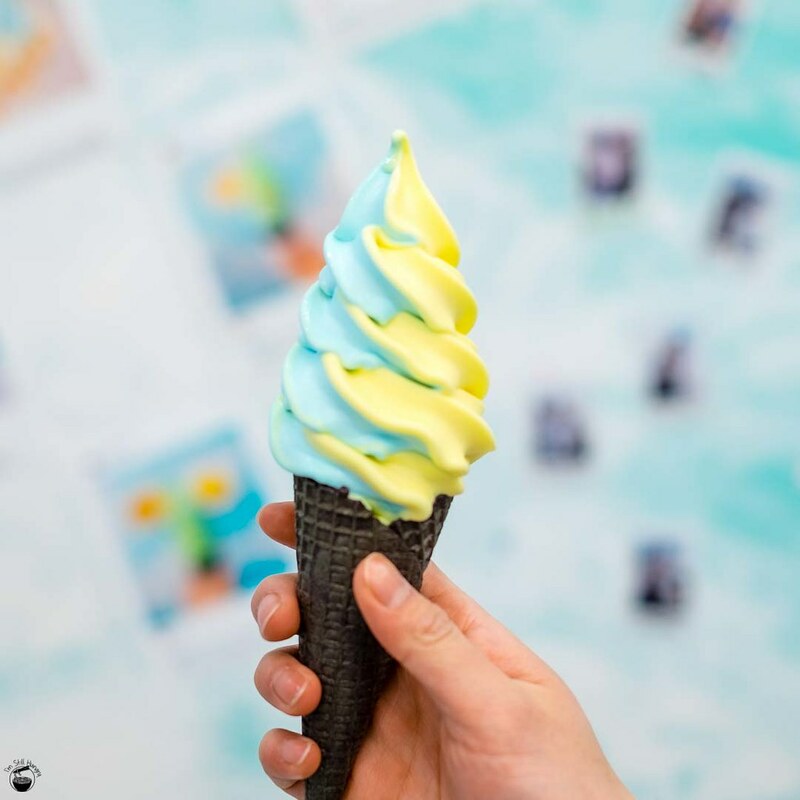 Regardless of that, twisting it with sea salt is where it’s at – who doesn’t want a minion-like soft serve? A pity they didn’t do minion-themed toppings! In any case, this is a decent flavour of the fortnight. As usual, it’s a lot less creamy than a true dairy soft serve, and tastes much more icy. Still, the sweet and tartness of the flavour make for a refreshing way to round off a bowl of ramen from Tenkomori next door [serving suggestion]. It tastes mostly akin to a real pineapple, but there is a bit of artificialness that can’t be helped. Good, not great, but here’s the surprise – it’s the better flavour this time round. And that brings us to the rum raisin flavour. Ah, it’s going to be a sad two weeks of not visiting Aqua S when the dairy option is a no-go zone. Rum raisin? Nope, it doesn’t work. Firstly, its texture seems oddly ill-suited for this combo. Perhaps it’s because I’m used to it being in an ice cream, with additional texture brought about by actual raisins included in each scoop. Thus texturally, I felt something was lacking. Further is the flavour – there’s just something off about it, making it taste almost like a funky cough medicine. It leaves a rather unpleasant aftertaste, which I believe is meant to be the rum, but in reality not going through anything like what it purports to be. The raisin aspect? It’s there, but it’s also just…queer. Here’s the thing, I clearly wasn’t uber-excited about the hazelnut flavour, so why in the heck did I get a double serve of it? Turns out I had a lucky streak with predicting how much I would like this flavour. It’s good. Like, really good. Think of a Ferrero x Nutella flavour combination, and this is smack bang on the money. It’s my favourite chocolate/Western-based flavour I’ve had at Aqua S, and you can bet that I demolished this double serve whilst still wishing for more. The hazelnut flavour carries through very well, and it’s as creamy as ever. I do wish the hazelnut factor could be amped up a lot more – similar to how the Earl Grey was lacking in its tea intensity. 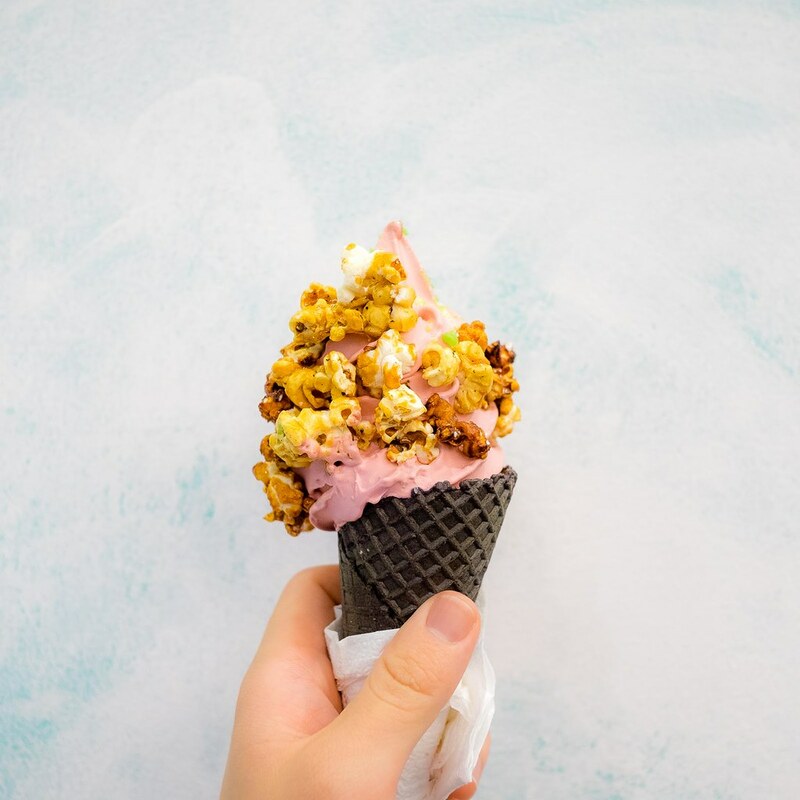 That said, the nuttiness of this flavour is pretty much my weak spot when it comes to ice cream – bring me a nut-based flavour and I’ll swoon. Amazingly, the Aqua S staff told me not a single bit of chocolate/cocoa was used in making this soft serve. Given the result – wow. For what it’s worth, those who have liked the grape-based flavours in the past will find lots to like in the pomegranate flavour as well. In terms of flavour, the pomegranate tastes pretty close to a grape. What makes a pomegranate taste like pomegranate is a unique ratio of acidity and bitterness that this soft serve doesn’t quite hit. In other words, if you’re getting this for the pomegranate, you may be disappointed. However, if you’re getting this because you like grape-y, fruity flavours in general, and have had a good track record with Aqua S’ dairy-free options in the past, you will be suitably satisfied with this option. And that’s it for this update! Look out on Instagram for a possible triple rendition of Hazelnut. I’m loving it! I should start this update off by congratulating Aqua S on opening up their second store! It’s located at Macquarie Centre, so get in on it! The flavours are the same as the CBD ones, so neither will be FOMOing over the other. As for this fortnight’s flavours, Aqua S is skirting closer and closer towards the coveted matcha flavour that I’m sure they’ll one day introduce. For now, they’ve begun to crawl aboard the tea-based bandwagon with the introduction of Earl Grey, with Grape as the dairy free option. I expected this to go the same way as all other such flavour pairings go – that the dairy-free version, while nice, is ultimately the safer and less “exciting” option, while the milk-based flavour is where the action’s truly at. Such was definitely true for the pumpkin soup vs cranberry of last fortnight, and there are plenty of other examples to cite. This time, I was wrong. The Earl Grey flavour, while unmistakably tasting of tea, was lacking the citrusy zest that defines the tea’s flavour profile. In addition, there was an oddly medicinal aftertaste with each lick, which dulled its attractiveness. It wasn’t prominent, but detectable. As such, this is a case of Aqua S promising a flavour, but not quite hitting the mark. To be fair, that’s rare these days, but it happened. The grape flavour on the other hand, was a surprising winner this time round. While not able to match the dairy-rich creaminess of Earl Grey, it managed to pack in a solid whack of flavour. Punchy sours and grape-y aftertaste make for an almost sorbet-like flavour profile, but with a far creamier texture, relatively speaking. It reminds me of Hubba Bubba sour grape gum, which is a nostalgically enticing memory. Grape wins – texture loses out to flavour this time round. To be sure, I’m not enamoured with either flavour, but here’s your fix for the next two weeks! Aqua S has survived its first six months. That was pretty easy to figure out, as they’ve rotated 12 times with little hiccup. 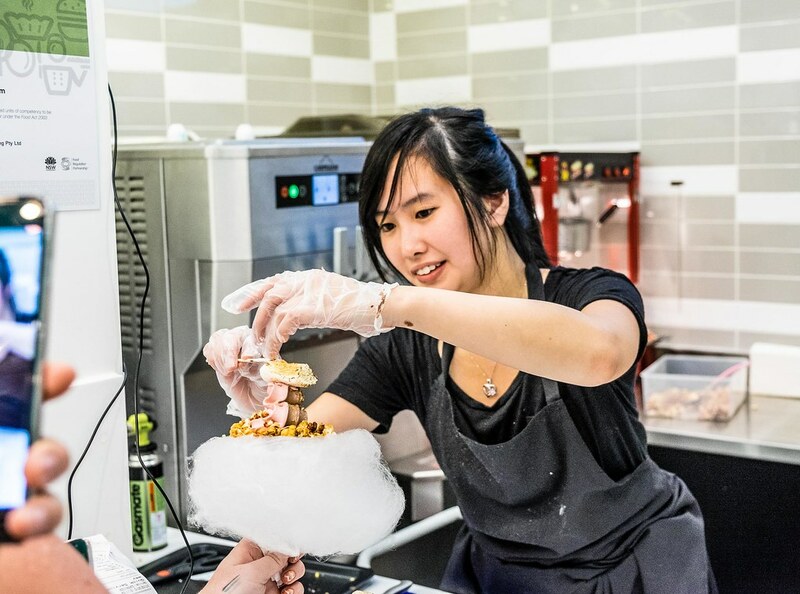 For one ice creamery to offer 24 flavours in such a short amount of time is nothing short of impressive, albeit being marred by the occasional failed experiment. But hey, as clearly evidenced by the queues outside the place during peak times, you know as well as I do that such a strategy works – regardless of what you think about the place. But now, they’ve really upped the ante, playing a riskier game than ever. Case in point: pumpkin soup. But yo damn, I wish I hadn’t. The pumpkin soup is the sh*t. Don’t get me wrong, it’s probably not good enough to be part of Aqua S’ hall of fame (I’m still waiting for that btw…), but it is far better than what you might think. A shame, really, as when I went again at nighttime, only one person had the game to order the pumpkin soft serve. Y’all missing out people. What would you consider to be a well-made pumpkin soup? Creaminess? Check. A rich, deep and sweet pumpkin flavour that’s got an edge of savouriness and a tinge of spiciness with every slurp? Check. 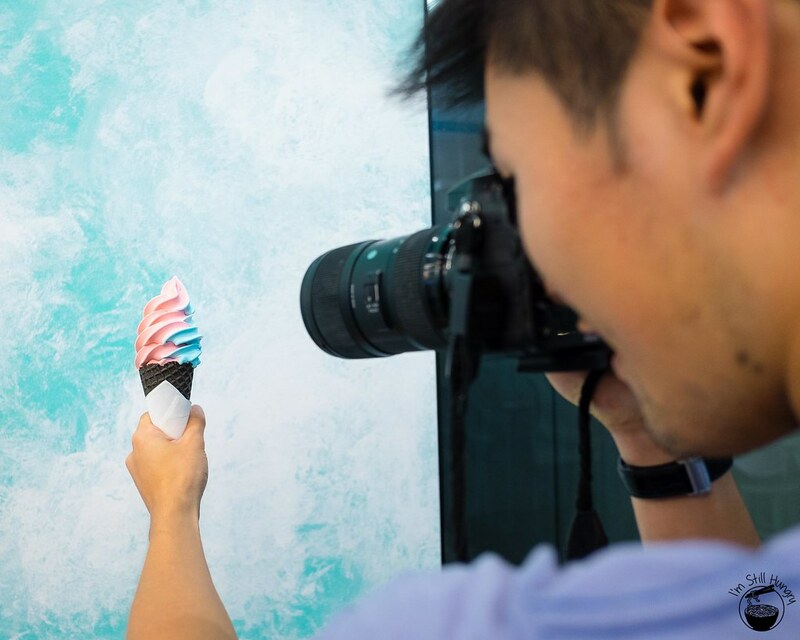 Aqua S somehow manages to capture this and put it into a soft serve. It’s exactly what it says on the name. To boot? 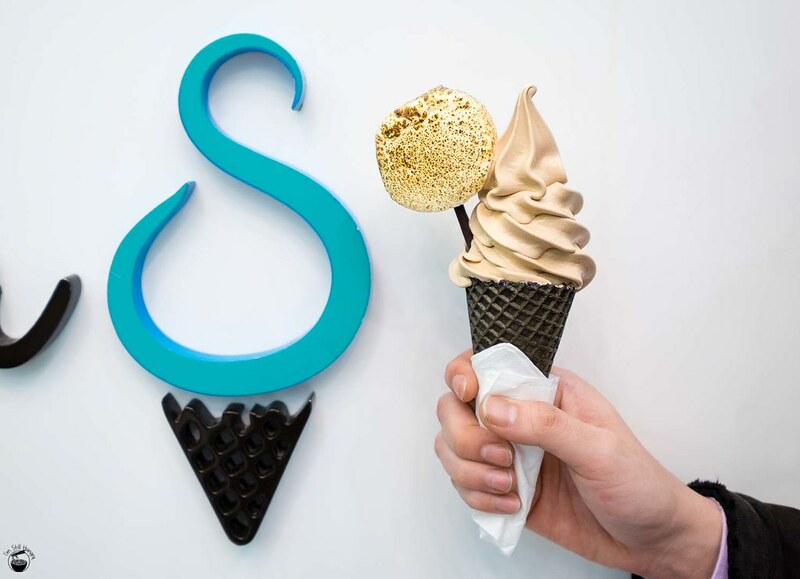 It’s quite possibly one of the creamiest soft serves Aqua S has put up. This is critically important, as an icy texture would not do a pumpkin soup justice. Get the texture right, and the flavour will follow. For those worried that this would be a tomato debacle, fear not – it’s on a different plane of existence. At the very least, it’s worth a try. It won’t appeal to everyone, but I’m definitely coming back for it. P.S. do not get this with any toppings – their sweetness will interfere with the pumpkin’s delicate balance of sweet & savoury. You’ve been warned. The dairy-free option of cranberry sees a lot of love by default, since, you know, the other flavour is pumpkin. To its credit, it is probably the best dairy-free soft serve I’ve had after tofu. It also dials down on that artificial fruity sweetness that was a bit off-putting in earlier fruit renditions. A good flavour, to be sure, but not terribly exciting, and is assuredly the safe alternative to pumpkin. I guess Aqua S couldn’t have taken too many risks in one go. P.S. 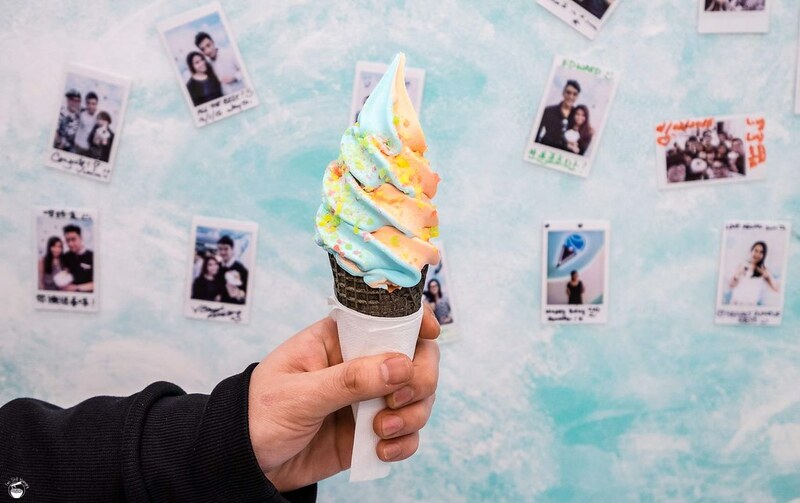 for the next week, Aqua S is offering free popping candy on any soft serve purchased to commemorate their Instagram account reaching 10k followers! Today, tragedy befell me. The machine that dispenses one of Aqua S’ new flavours – Caramello – was broken. I had to make do with their other new flavour – Green Apple. Could it be the first time in many months that I’m not the first to bring you the low down on the first day? So it would seem. Ah, the crisis is real, but fortunately, I’ve got soft serve to cheer me up. 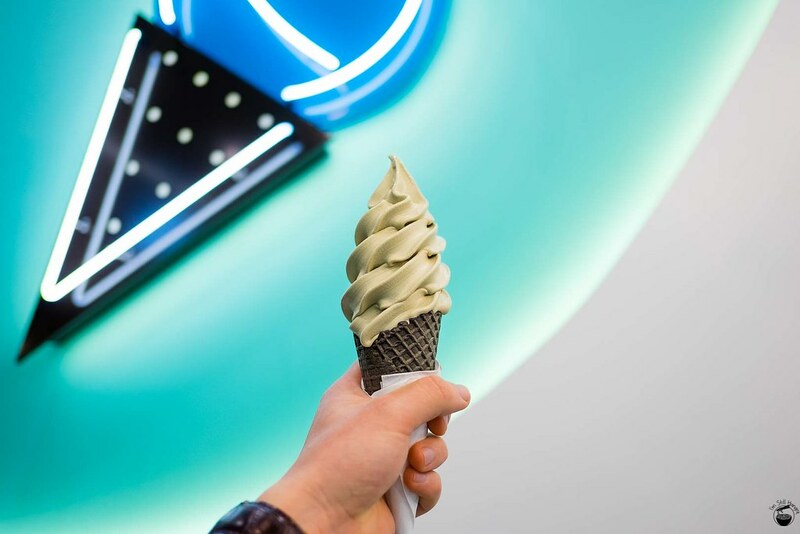 Specifically, the green apple soft serve. Out with the old and in with the new – the green apple is officially in! You would be correct – where fruit punch was an unmitigated downer for me, the green apple is…unfortunately roughly in the same territory. There’s a pronounced tartness, an acidity to the flavour that is reminiscent of all those Granny Smith apples you hated eating, but your parents kept buying. It’s not that sweet at all, and in fact, there isn’t much flavour to go about. 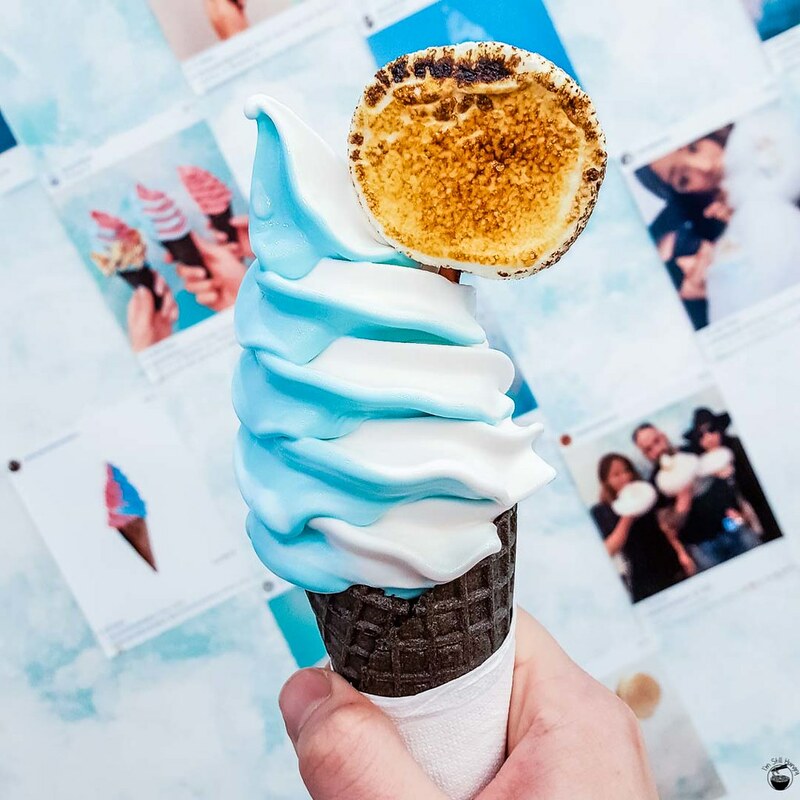 As it is the dairy-free option of the fortnight, texture is also on the icier side, however it is much creamier than any of the dairy-free Aqua S soft serves I’ve had previously. 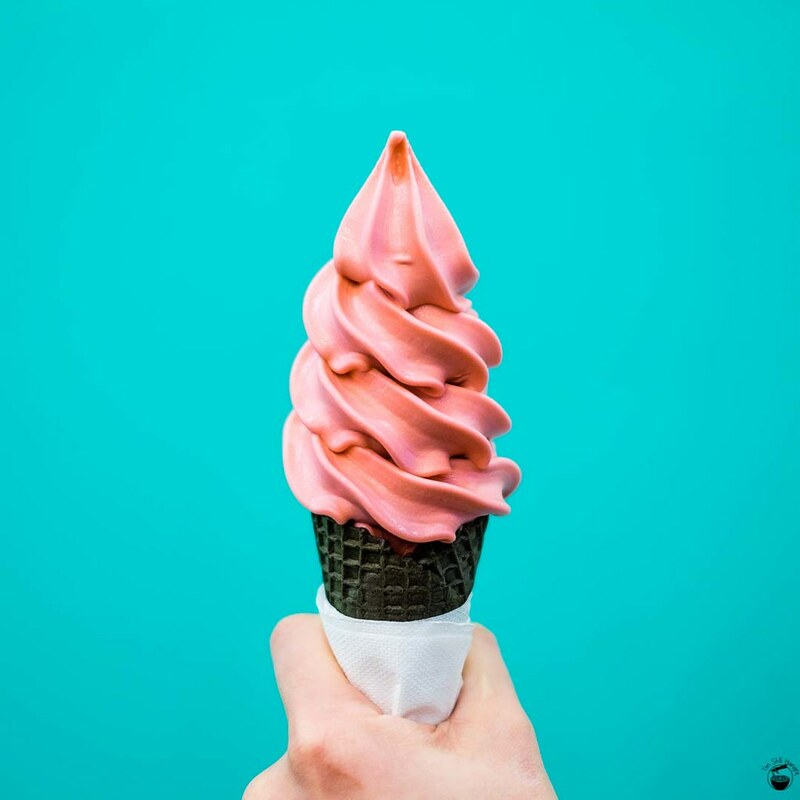 So you do get something – it’s as creamy as a soft serve is going to get while remaining dairy-free. I suspect those into astringent flavours will derive enjoyment from the green apple flavour, but it is not for me. Fortunately, a Koala comes to the rescue! 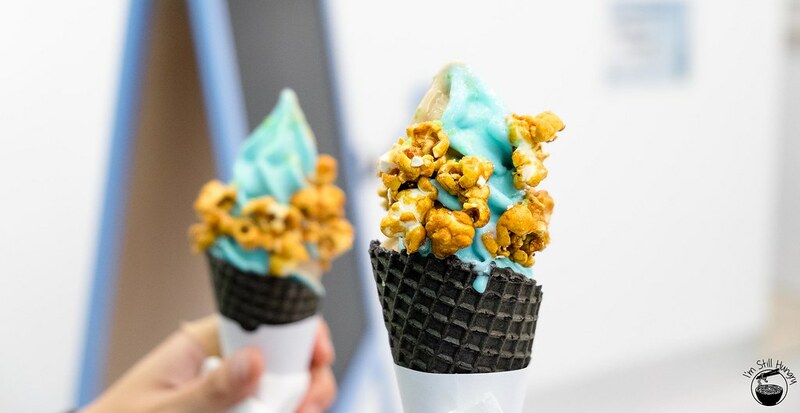 Who hasn’t wanted a Caramello Koala in soft serve form? 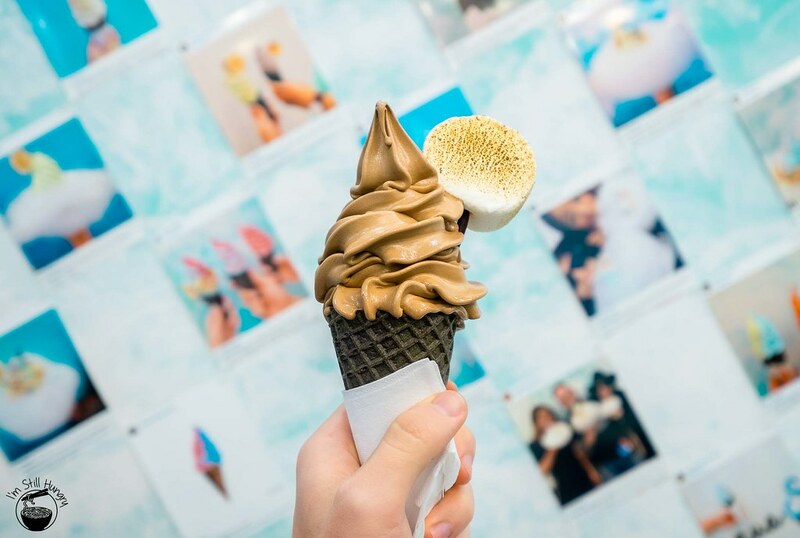 But back to Australia’s icon in chocolate-turned-soft serve. If you’ve had a Caramello Koala before – if you grew up here, you’ve no excuse – you’ll know what to expect. Aqua S’ rendition is…questionable. It’s a better flavour than green apple, but the caramel flavour is not as strong as I’d have liked it to be. 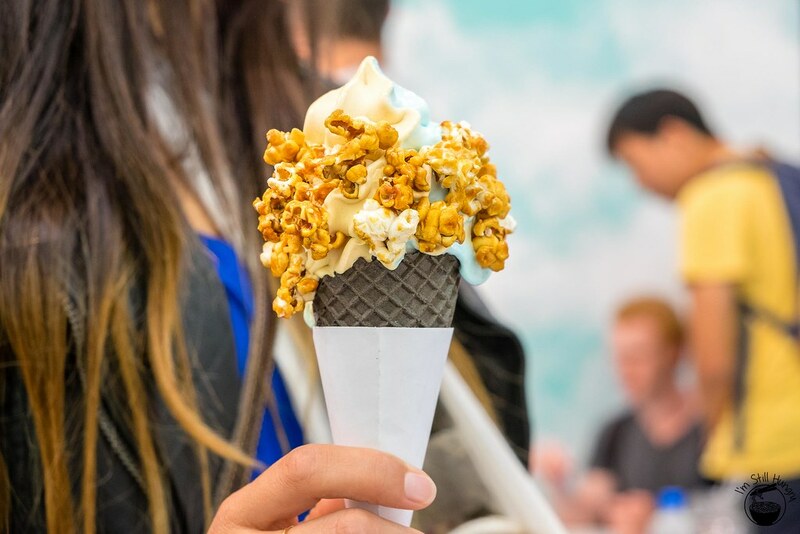 It’s noticeable, but it’s really just a caramel soft serve (not salted caramel – just caramel). I imagine if you mixed it with sea salt, you would have made a faux-salted caramel soft serve. Worth a try! All in all, while it may not have triggered my nostalgia switch like the Tofu flavour, it’s a modestly acceptable flavour that should carry for the next two weeks. And hey, in the end – it’s still gosh-darn creamy. Hey Mickey you’re so fine, you’re so fine you blow my mind, hey Mickey! Hey don’t judge – we all like Mickey Mouse, ok? The staff even know the order now – Mickey Mouse marshmallows! The first time they’ve tackled caramel! I can’t believe it – a solid ten for ten, and I’m still going strong. Fueled by Aqua S is such a thing of the past – I’m practically made of the stuff. 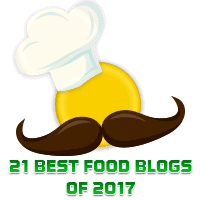 It’s pretty rare when your blog post on an eatery outranks even its Zomato (R.I.P. Urbanspoon) page. I guess all you needed to do is post over six thousand words on the place and relentlessly update it every time something new comes out. The fruit punch flavour. Aaaaaand I kind of wish I didn’t. I feel that for this particular flavour, Aqua S has played it a little bit too safe. The flavour is not the same as say, the watermelon, creaming soda or any of the other bevy of fruit-flavours that came before it, but it doesn’t do anything to meaningfully differentiate itself from them either. It doesn’t taste like any fruit in particular, which sort of makes sense, given it’s a fruit punch. However, that does mean it’s just a mass of sweetness, without any real definition to it. It’s not particularly sweet, instead taking on a slightly more acidic edge which isn’t particularly palatable. 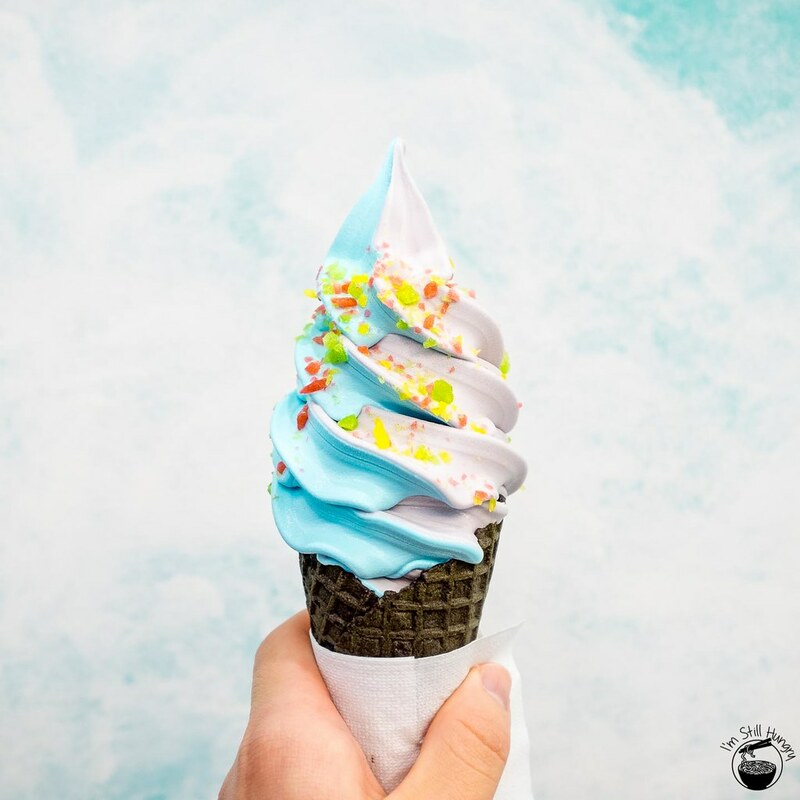 Being the dairy free flavour this time around, its texture doesn’t win any points either – it’s quite icy, relatively speaking. There’s not much going for this flavour. Curious as to what it tastes like with sea salt? Sorry, no can do – the machine was out of order! …the Venus de Milo. Oh sorry, my bad – it’s just plain old Milo. Don’t look down though – Milo is a badass drink powder, on par with Ovaltine or Nesquick. I used to snort this stuff during my childhood days (hey, it beats snorting other substances – don’t do drugs kids!). 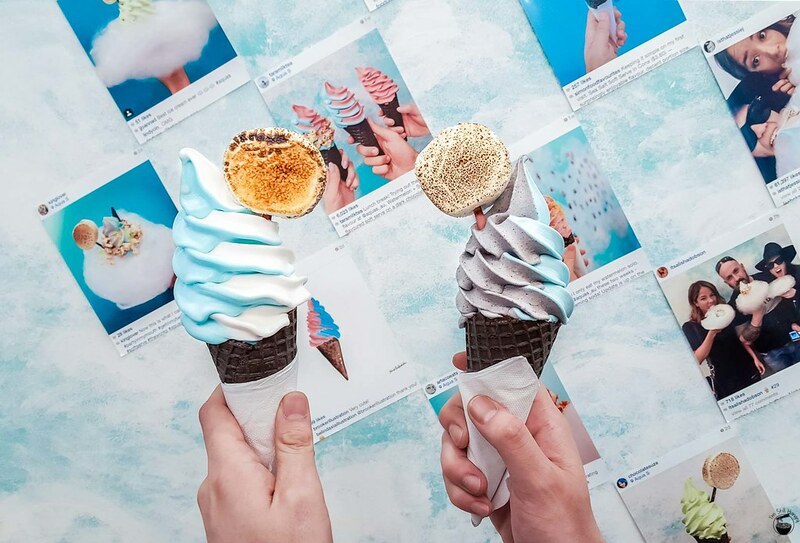 In soft serve form? Totally works. What makes Aqua S flavours great (for the occasions when they are) is that the taste actually captures the ingredient(s) that are named. Taro actually tastes like taro, tofu actually tastes like tofu, and so on. The trend continues with Milo – it really does feel like I’m eating a Milo soft serve, as if Milo was churned into milk & cream and then spun out into soft serve. Oh wait, that’s exactly what happened. And that’s why it’s so good. If you’re a Milo fan, or even a chocolate milk diehard, this one’s for you. So Aqua S has achieved 1/2 good flavours this time around. Hey, as long as it’s not 0/2, I’ll keep coming back. It’s time to drink some chocolate milk. Last fortnight, I totally digged the apricot and espresso flavours Aqua S churned out. They were almost good enough to make me forget about the heart-rending departure of tofu and taro. 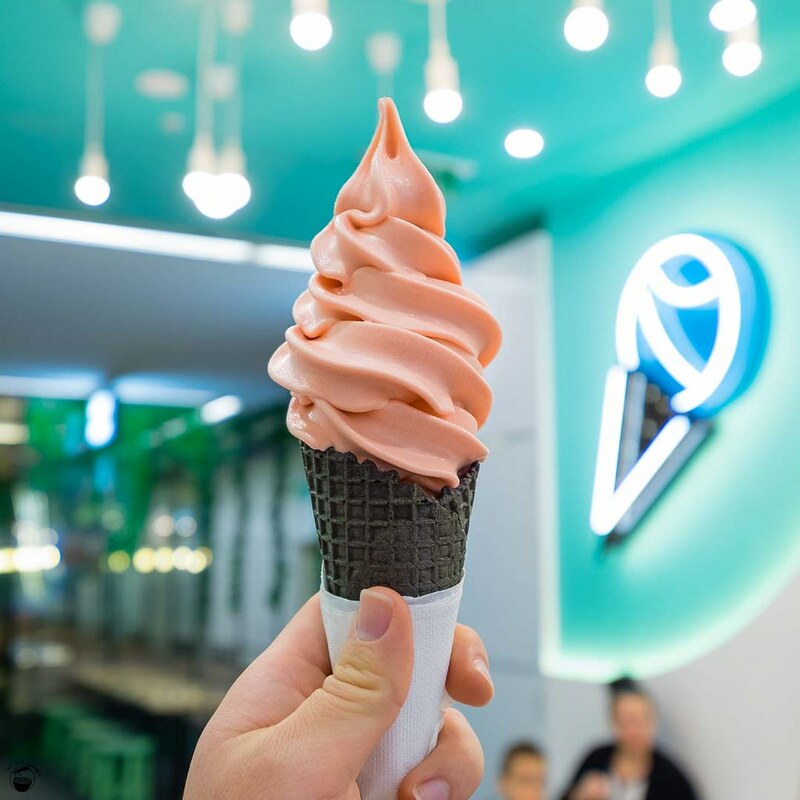 Fortunately, it appears that Aqua S is on a double streak this time around, bringing out much-loved Asian flavours lychee and black sesame. My friends went nuts when I sent them a picture of the menu, and rightly so. It’s about time these flavours came along! It’s all good news this time: both flavours are worthy of recommendation. The black sesame is my personal favourite, as that’s simply my preference. 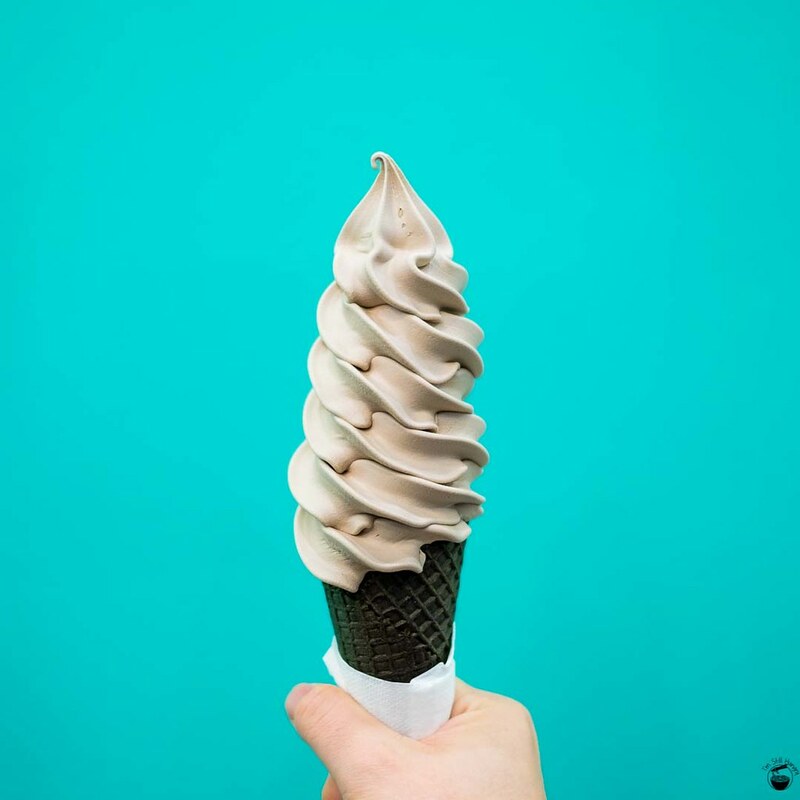 It’s the creamiest black sesame soft serve/gelato/ice cream I’ve had – boy, is it smooth. The flavour of the black sesame itself isn’t particularly strong like Aqua S’ fruit flavours, so I would recommend having it by itself, rather than with sea salt. I found that with sea salt, it’s taking on too much of the sweetness from that flavour, stealing from the sesame’s thunder. There is one other small downside. I’ve never had a black sesame dessert that’s been so creamy – in gelato or ice cream, there’s usually a “grittier” texture that’s part of black sesame’s character. With Aqua S, this grittiness is greatly reduced. I actually like that grittiness, and I’ve long become used to associating a good black sesame dessert with it. 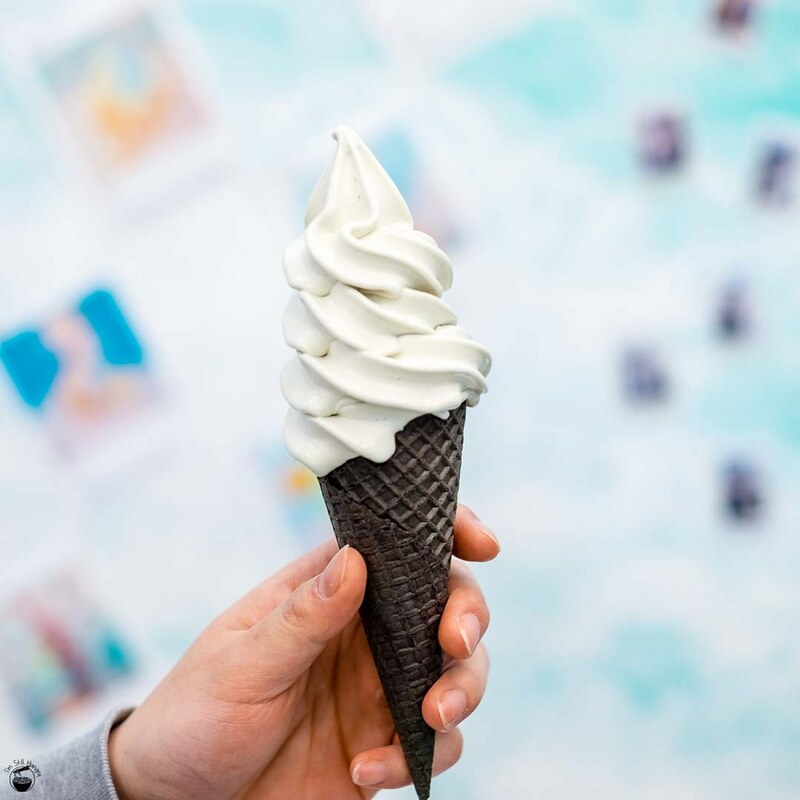 I’m not sure how that can be rectified with a soft serve dessert that’s inherently meant to be creamy throughout, but as it stands, I’m torn between a traditional black sesame ice cream, and this rather wonderful soft serve version. Perhaps I should just be happy to be able to enjoy this version for two weeks – fleeting as always! It’s still a great flavour that I’m happy Aqua S has introduced! As for the lychee, this is a true blue lychee flavour. I’ve recently mentioned that Aqua S is beginning to deliver really authentic fruit flavours that don’t go over the top. This trend continues – it’s unmistakably lychee, but doesn’t go over the top with faux-sweetness like earlier fruit incarnations. If you’re a lychee fan and have been holding out, your time has come. It’s slightly less creamy than the black sesame, but that could just be my imagination! 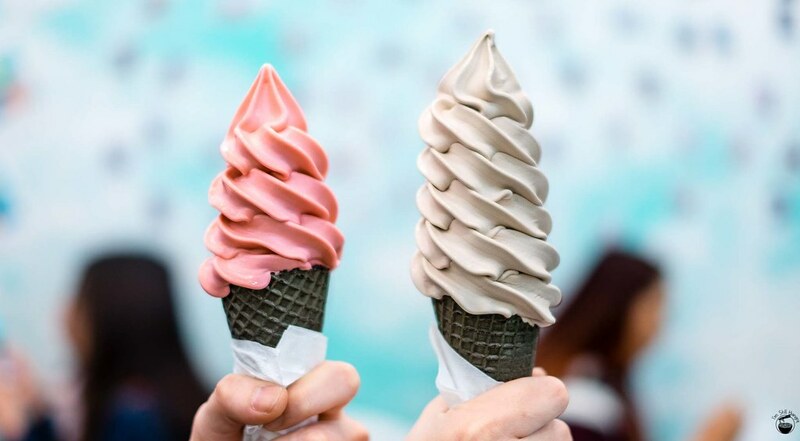 Two for two flavours on point! Unfortunately, neither the grapefruit and mint chocolate flavours from Aqua S’ seventh update struck a chord with me. While its creamy texture is on point as always, I wasn’t too keen on the bitterness of grapefruit or the rather plain taste of the mint chocolate. It was a dark two weeks, with only eh initial visit made. With hard times comes hope – as lucky update number 8, comes a duo of fortunately tasty flavours. Say hello to espresso and apricot. Now these are flavours I can see myself getting behind. I’ve already called it – revisits are in order! I feel Aqua S have improved their fruitier flavours since the melon milkshake and apple blackcurrant flavours. While I personally quite liked them, I understood feedback from others that bagged out its sweetness. I do feel that the apricot flavour has rectified that to an extent – this is a toned down version, and tastes authentic enough that if you fed it to someone who didn’t know any better, there’s a good chance they could tell it was an apricot (or a nectarine-like flavour, at the very least). 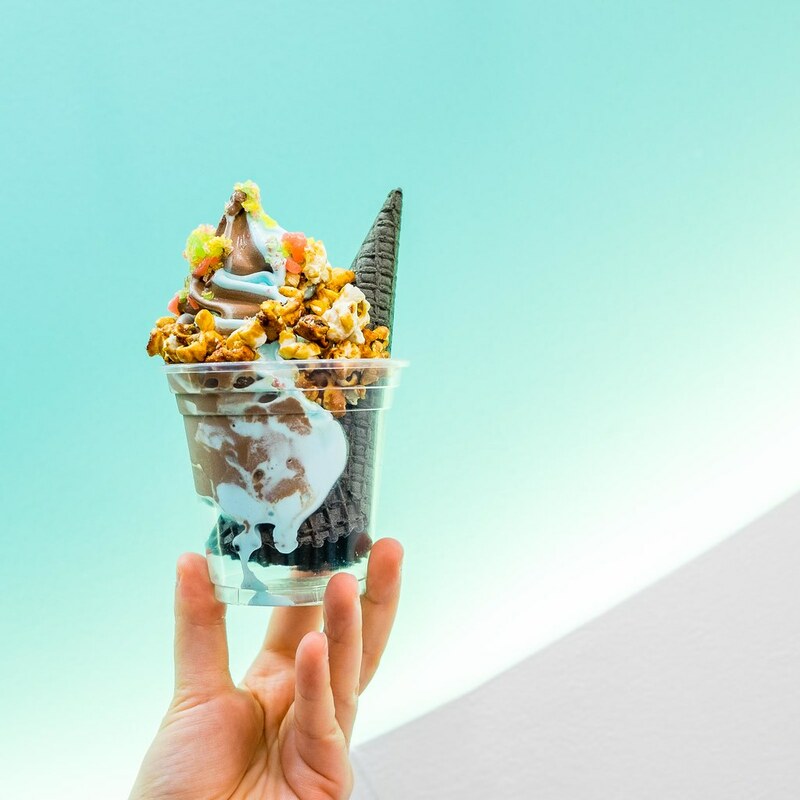 Texturally, the soft serve was a bit stiffer than what I’m used to at Aqua S. To be honest, I thought it was fine, but it’s not the ultimate in creaminess, if that’s what you’re looking for. As far as fruit flavours go, Aqua S may have done their best one yet. Should you take it with sea salt? I would recommend no, as the fruity tartness of the apricot is best left to stand by itself. As mentioned earlier, the reduced intensity of this flavour means that sea salt has extra opportunity to steal the show. The espresso flavour is what you get if you combine the potent bittersweetness of coffee beans and the creamy, creamy texture of Aqua S. It is strong, which is a huge plus in my book. A weak coffee taste would undermine the point of introducing such a distinct flavour. Plus, I take my coffee strong or piccolo-sized, so this flavour is made with my name written on it. For once, I’m a bit undecided whether to mix this with sea salt or not. On the one hand, when had by itself, it’s pure coffee joy in soft serve form. On the other hand, taking it with sea salt almost turns it into something akin to a tiramisu kind of flavour, but one that is better than the actual tiramisu flavour Aqua S introduced awhile back. Pure coffee snobs? Espresso solo all the way. Want a bit of a salted coffee/salted tiramisu kick? You know what to get. Want to just take a good looking photo? Then I guess you’ve already made your choice. Looking forward to several revisits this time round! Oh my god. What have I done. Seven updates. Seven. My friends are right, I really can’t stop now. Aqua S has my soul, exploiting my one predilection: to be at the mercy of the “new”. With every second Thursday, my fate is sealed. Whoops, sorry about that. That’s two flavours, I swear. 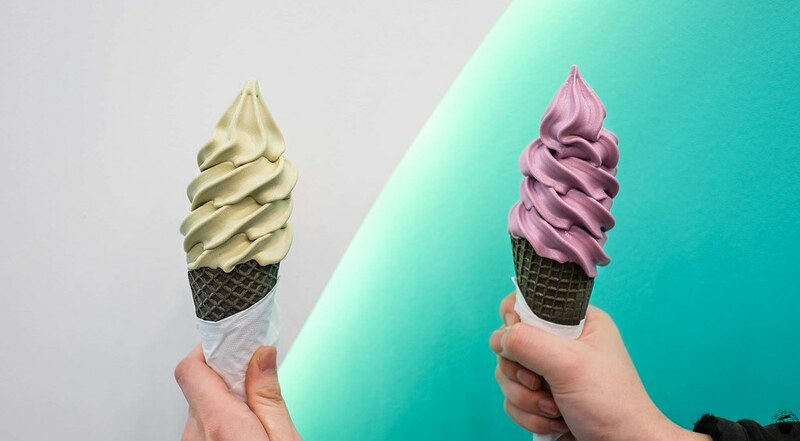 If you have x-ray vision that somehow filters out brown, you’ll see a pink soft serve underneath (more or less the same colours as previous pink Aqua S flavours). They are mint chocolate (probably what you’re looking at right now), and pink grapefruit (what you’re looking at if you have pink-and-brown-filter-vision). In case you didn’t know, you can actually get one flavour on top of the other, in order to be able to try both flavours for the same price, without having to get them separately with/without sea salt. Valid for cups too. 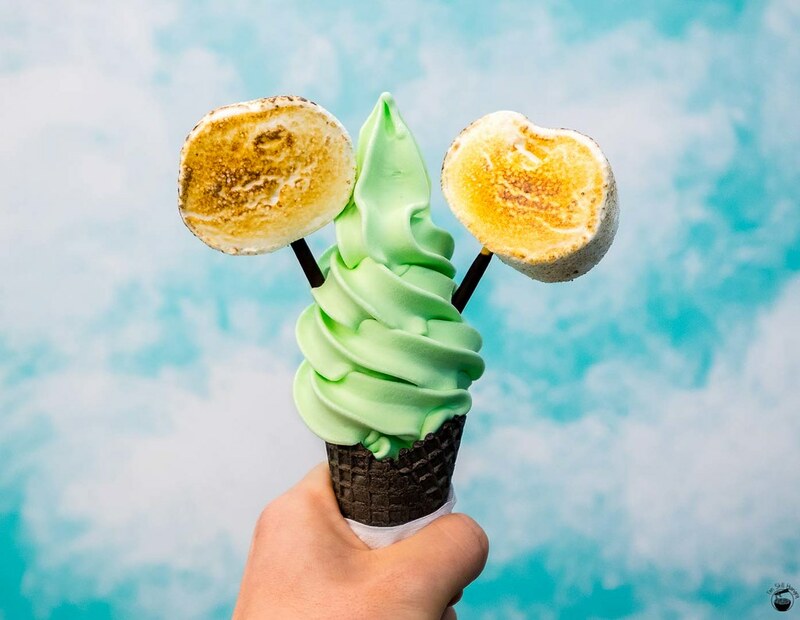 If you’ve been following people that post Aqua S photos (in other words, basically 95% of Sydney’s Instagram user base), you may have already noticed that the marshmallow topping now comes on top of a Pocky stick, and in a bigger piece. I like this change, because when you think about it, you’ve previously been paying $1.5 for just two piddly marshmallows. Remember you can get entire bags for that kind of money…so this is an improvement! 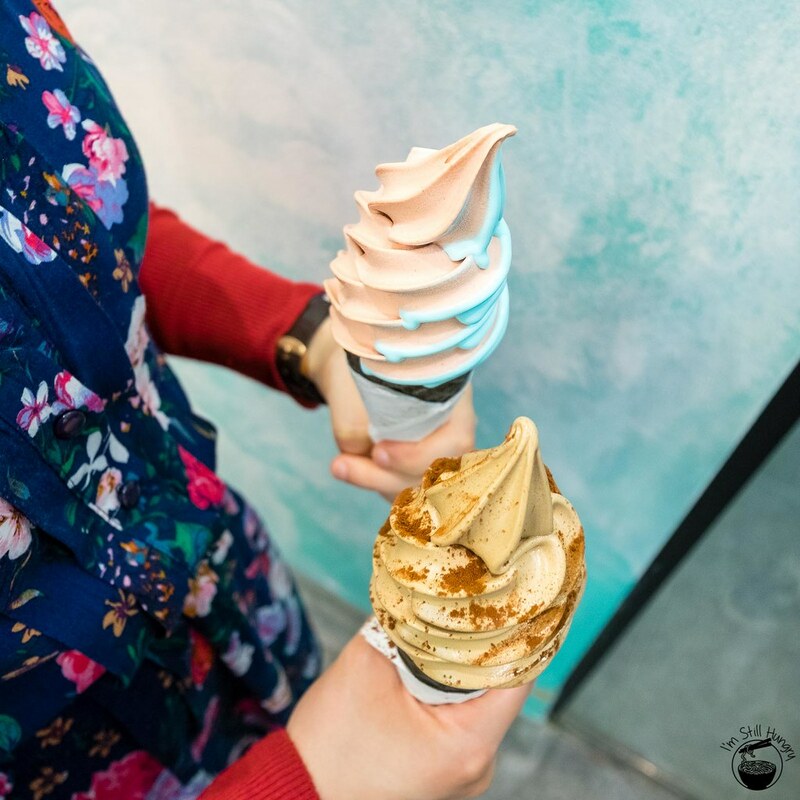 In terms of the flavours, the short of it is that – if you like to eat the underlying item the flavours are based on, you are on your way to liking the soft serve. Like eating mint slices? Go get the mint chocolate! Like gorging on grapefruit? Go for pink! In my case, I’m slightly partial towards mint chocolate, so that became my preference. I could never fully get into grapefruit, so that flavour was not quite my style. On the flip-side, I’m able to say this because the flavours are remarkably similar to the actual descriptions: you really feel like you’re eating mint choc – refreshing buzz and all, and the grapefruit carries its hallmark astringency, as if you’re truly biting down into grapefruit. The owners of Aqua S have justified this round’s flavours from the fact that the previous round was all about the sweet and fruity. This time, a bit of a return to more astringent/bitter flavours are in order. I can’t say I’m a fan, so I’m calling this to be one of Aqua S’ weaker rotations. As usual, let your own taste buds are the judge. P.S. the grapefruit flavour tastes creamier than the chocolate, which is a bit icy. Texture hunters, you’ve been informed! I’m pretty sure they just need to cover green and they’d have the whole rainbow down pat (screw you, magenta). …it’s just not the green I expected. Sorry folks, we’re not at matcha-levels yet, but Aqua S is still showing us our childhoods with the Apple & Blackcurrant and Melon Milkshake flavours for this month. The short version: this time, both flavours are pretty good, albeit on the sweet side. I would also prefer them to be creamier. All in all though, I think I’ll be coming back for these – two for two this time! Who hasn’t had Ribena when they were growing up? If you’ve had it, then I’ve got some news for you. 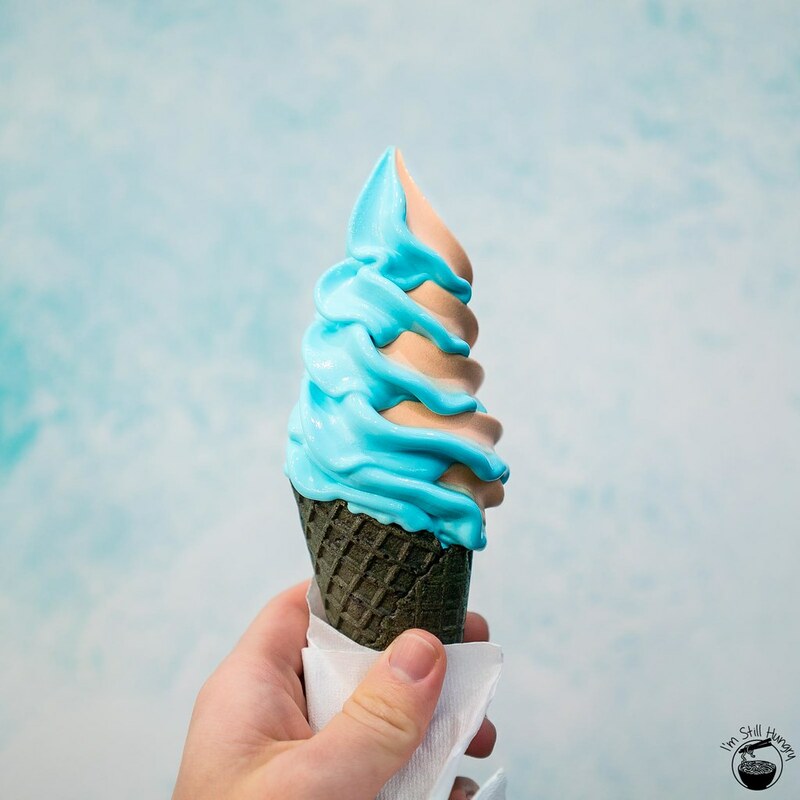 If you haven’t had it, buy an Aqua S Apple & Blackcurrant soft serve, wait for it to melt, and drink the results. Well, it won’t be the same due to the cream, but you get my drift. This flavour is uncannily like Ribena – a blackcurrant drink. Flavours of grapes dominate this particular flavour, while hints of apple can be found in the aftertaste. 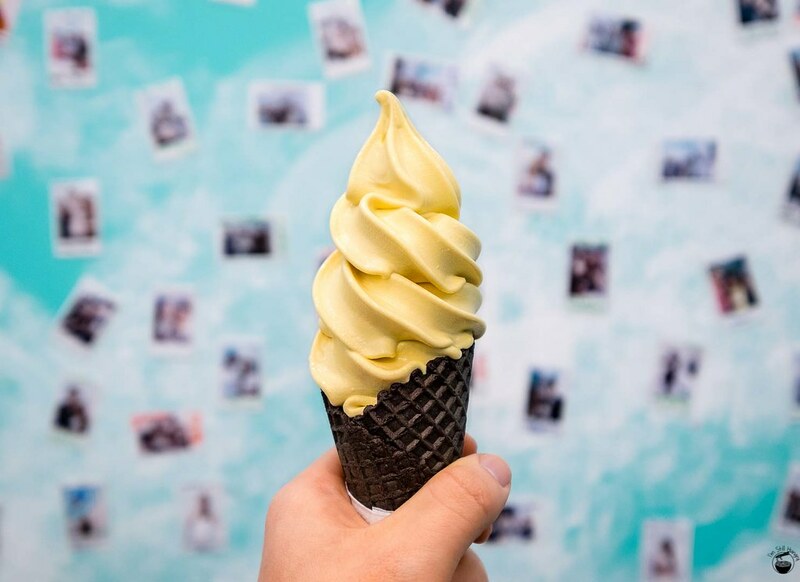 The texture is a bit icier by Aqua S standards (which means it still totally owns every other soft serve out there), but I would like to see something similar in consistency to the heavenly tofu flavour of ye old previous two weeks. Overall, it was surprisingly enjoyable, despite the sweetness of it. Coming from the rather mild tofu, the sugar in both these flavours hit you hard, the Ribena flavour especially. I’m also happy to report that unlike some previous flavours, this one doesn’t taste as artificial. We’re onto something here. I’m not infringing on copyright by using Ribena, am I? Now onto a second childhood drink, though perhaps more for the Asian lot of you – who’s had a honeydew milkshake before? The likes of Easy Way come to mind. I used to get a honeydew milk tea (less tea, more milk) on a near-weekly basis, and no, I did not care that there’s more sugar in there than is required to power a car for a road trip to Perth. That’s what the melon milkshake flavour brings out of me. And I really like it. The texture on this one tastes slightly milkier than the Ribena flavour, which makes sense. That aspect is what wins me over. Texture is king. The flavour on the other hand is very much like a honeydew melon, but with a greatly amplified level of sweetness. Aqua S, please tone it down just a bit! Other than that, no significant niggles from me – I see myself getting this one a few times over the next two weeks. Can it surpass my four-time record for tofu though? Hmmm…. Reduce the sweetness, increase the creaminess, and these two weeks should be smooth sailing for Aqua S.
I’m still waiting on my matcha, heh. Minor Addendum to Update 5: A Creamier Tofu, and Is It Worth Having with Sea Salt? In Update 5, I mentioned that the tofu flavour is good enough to have by itself, and that having it with sea salt would probably spoil the delicate subtle flavours of the tofu. Yeah, I was totally wrong about that. Tofu and sea salt work like a bomb. It could be the fact that the sea salt brings out something within the tofu, but honestly, I’m beyond caring at this point. This is an amazing flavour, and so very close to my alltime favourite of taro. The tofu mixture has also been tweaked, such that it’s now much creamier and less icy than before. I like icy for the fact that it’s refreshing, but I will choose creamy over icy nine times out of nine. I’m getting another one now! So it’s that time of the month again, is it? Well, rather, that time that occurs twice in a month. Aqua S rotates flavours so frequently that it can be hard to keep up with the whirlwind of colour. In fact, I’m pretty sure they just need to cover green and they’d have the whole rainbow down pat (screw you, magenta). The previous fortnight featured watermelon and creaming soda, repping team red/pink to the max. This time, Aqua S goes right off the beaten path – and yes, that even takes into account the tomato flavour released awhile back. They’ve brought in a tofu flavour. There’s going to be two ways to go about this. There are those who are used to eating tofu (because they like it or have a stereotypically Asian upbringing), and those who rarely eat it (yes, people do exist that hate tofu. I don’t know those people). 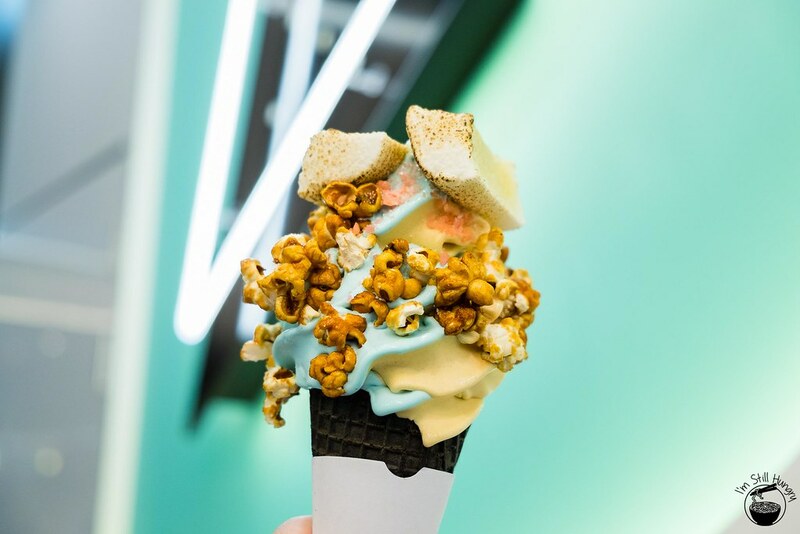 To put it simply – if you love tofu, this soft serve will appeal to you. 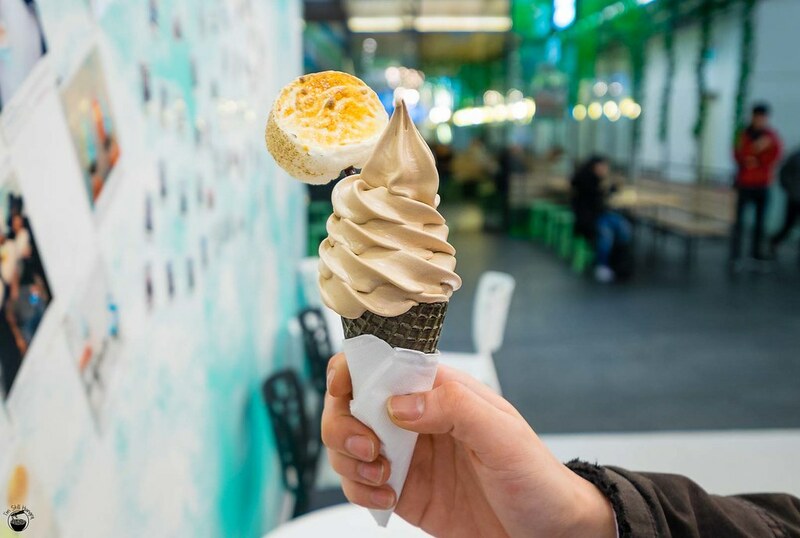 If you’ve never had a thing for tofu, this soft serve may still be something worth trying. I really, really like this tofu soft serve. Yes, it does actually taste like tofu. With every bite there’s that familiar soy taste which amplifies in aftertaste. The texture is of course, soft serve, not tofu. 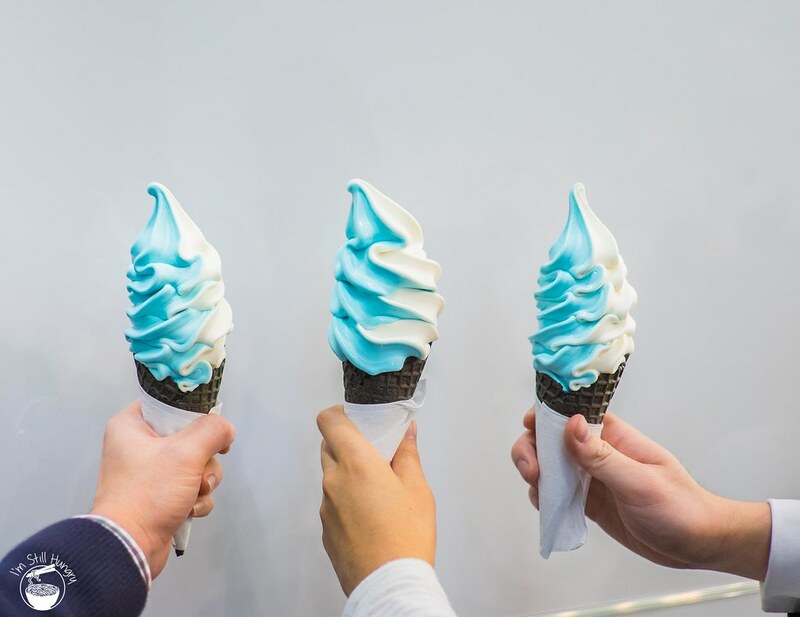 That said, due to what must be the ingredients in this particular flavour, the soft serve actually holds up a LOT longer than most Aqua S flavours. You actually have more than mere seconds to take your photo this time! Best flavour since taro, hands-down! If the tofu flavour can be described as the ‘risk’ of this fortnight’s rotation, the mango orange becomes the ‘safe’ option. Flavour-wise, it is best described as a mango-flavoured sherbet with a citric acidity to it, and lacking the fizz. It’s an OK flavour, but it is quite sweet, and it borders on artificial in taste. I’m not sure I would get this flavour by itself – the ‘vanilla’ sea salt would be instrumental in removing some of the sweetness. So basically, artificial sherbet flavour; at least it’s still got Aqua S’ classic creamy texture! Tofu, the risky play, wins this round! And yep, I’m coming back for the white goods. After the “interesting experiment” with “mixed results” that was the tomato flavour in update 3, it may not be altogether too surprising to know that Aqua S’ next update involves slightly less tomato. That said, their colour is still one of their main selling points, and let’s face it, pink and blue made for an awesome colour combination in the tomato. Why not retain the pink, but revamp the flavour? Welcome to the pink twins – watermelon & creaming soda. It’s not easy to tell them apart, though if I had to guess, the watermelon flavour has an ever so slightly darker tinge. This time round, the flavours are almost as good as they look. The creaming soda flavour (pictured above) is a flavour I describe to my friends as “more creaming, less soda”. That is to say, Aqua S’ amazing texture lends itself well to a “creaming” soda concoction. Flavour-wise, it’s more of a generic vanilla, which makes sense as that’s what creaming soda is traditionally flavoured with. There’s a bit of that Redskin taste as well (hi-five if you remember those! ), but it does lack the “soda” aspect, which I was expecting. The watermelon flavour (above), while looking like the soda’s identical twin, is anything but on the inside. It does taste like watermelon, but more akin to a watermelon candy – a watermelon Chupa Chup as fellow blogger Philsosophyy would describe. As such, it’s a bit artificial, but artificial needn’t mean bad. It’s actually my preferred flavour of the two, but the competition is TIGHT. Now, to twist with sea salt or not to? In previous updates, I’m usually of the mind that you should twist with sea salt to achieve some flavour balance – the taro was a rare exception. Not so this time around. Like the taro, I recommend both the creaming soda and watermelon flavours to be consumed on their own. Their flavours are not as strong as previous heavy-hitters such as lemon tea, mandarin, or tomato (ketchup). This time, flavours are a bit more subtle, and sea salt stands a good chance of compromising that delicacy. You can always add some popping candy though! Life just needs to be exciting, sometimes. This would mark my 9th visit to Aqua S. I suppose it’s a foregone conclusion they have an “Aqua S Ambassador” position. After all, if they did, I’m pretty sure I’d be standing in front of line to apply. Then again, that’s pretty weird too, because I’m not head over heels over every flavour – the taro was amazing, but then they introduce a flavour like tomato, and you have to wonder just what you’re spending your $3.8++ on. A few other bloggers have described it as eating tomato ketchup with the texture & consistency of soft serve. Actually, that just about sums it up in the most succinct but still informative way possible. I really did feel like I could dip chips into this tomato soft serve and it would feel like the most natural thing in the world. As a dessert though, I’m not completely enamoured. It doesn’t taste bad per se, just very, very unusual, not a flavour I would readily go for in a soft serve. Having said that, I found that when it’s eaten with a 1:1 ratio of the sea salt flavour, a strange synergy develops which was enticing enough that I was pretty much on track to finishing the entire thing. I honestly can’t describe it any better than “it’s like a milkshake with a tangy/salty aftertaste, but that’s predominantly sweet”. Somehow, that actually works. Worth a try? How adventurous are you? The second flavour, tiramisu, is the less interesting of the two. It’s basic, and very safe. It’s kind of like eating a chocolate cake, but of course, with Aqua S’ hallmark texture. It’s nice for a few bites, and while it remains nice till the end, the flavour gets somewhat samey after awhile. That said, it is a better flavour than the tomato. That just about wraps up the third update. 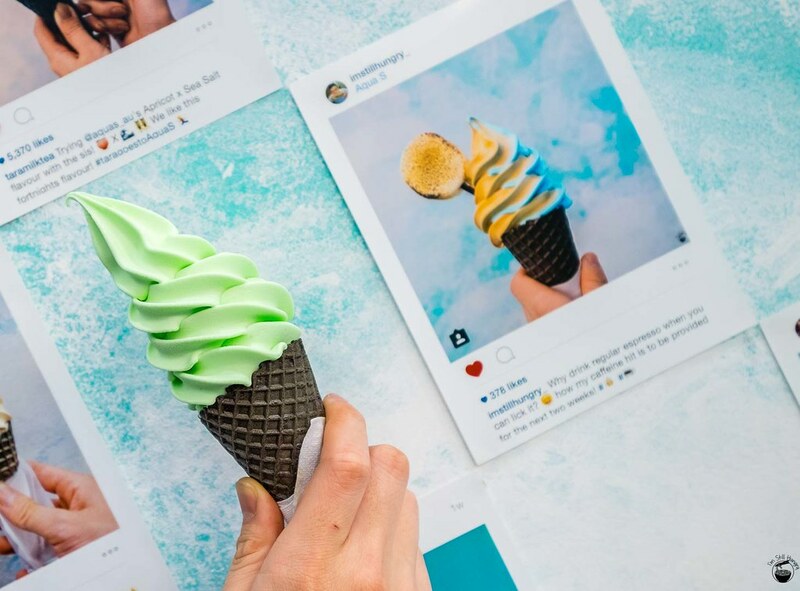 I’m still waiting on that matcha soft serve, just saying. Or bring back taro! First time reading this post? I suggest scrolling down, past the updates, for the original scoop! Veteran Aquamen and Aquawomen, as you were! There is a point where, by default, you become a brand ambassador. I’m pretty sure that by now, after my seventh visit, I’ve become the #aquasambassador. Now, where’s my loyalty card? I have to say, their mechanism of twice-monthly flavour rotations is a brilliant one. I can’t exactly say I’d have visited so frequently, were it not for this dedication to change. But enough of what, you want to know how the new flavours taste, don’t you? First up, we’ve got the mandarin. For those who were lucky enough to get their hands on the lemon tea flavour (part of the original flavour set when Aqua S opened), this may evoke nostalgic memories of that flavour. It’s very, very sour, not what you might expect, if you’re used to sweet mandarins. In fact, it’s more a kumquat-level of sour. If you liked lemon tea, you’ll like this one. Where it differs is that there’s slightly less acidity, and it lacks the strong tea flavour of the previous flavour. I personally like this as much as lemon tea, and would not mind interchanging. 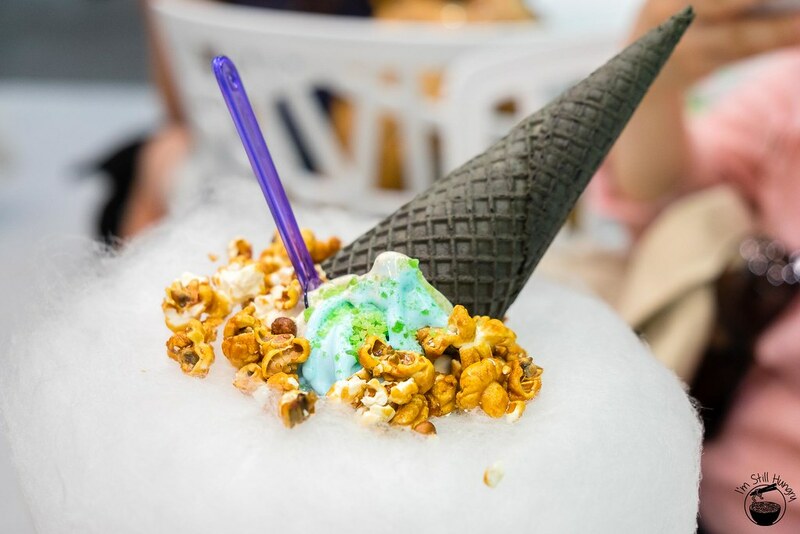 Would you like some soft serve with your fairy floss? The feedback from last time remains applicable here – unless you absolutely adore the sourness, pair it with the sea salt. The combination works to great effect. For a more exciting change, Aqua S has brought on one of the classically Asiatic flavours of taro. As an Asian, I’m going to be biased, but you’re probably with me on this one when I say that this flavour’s the best. I say best without hyperbole – for you see, my humble opinion is that this is the best flavour Aqua S has produced. It’s better than their signature sea salt, and definitely better than any of the other flavours released so far. 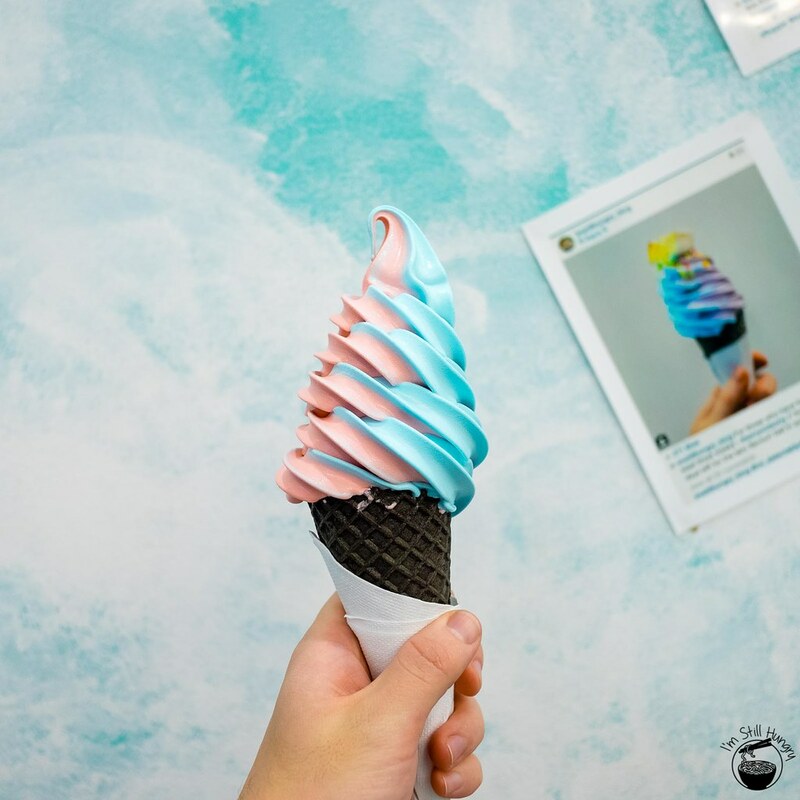 Aqua S does not hold back on the taro flavour, and paired with the uniquely creamy texture of soft serve makes for a killer combination. 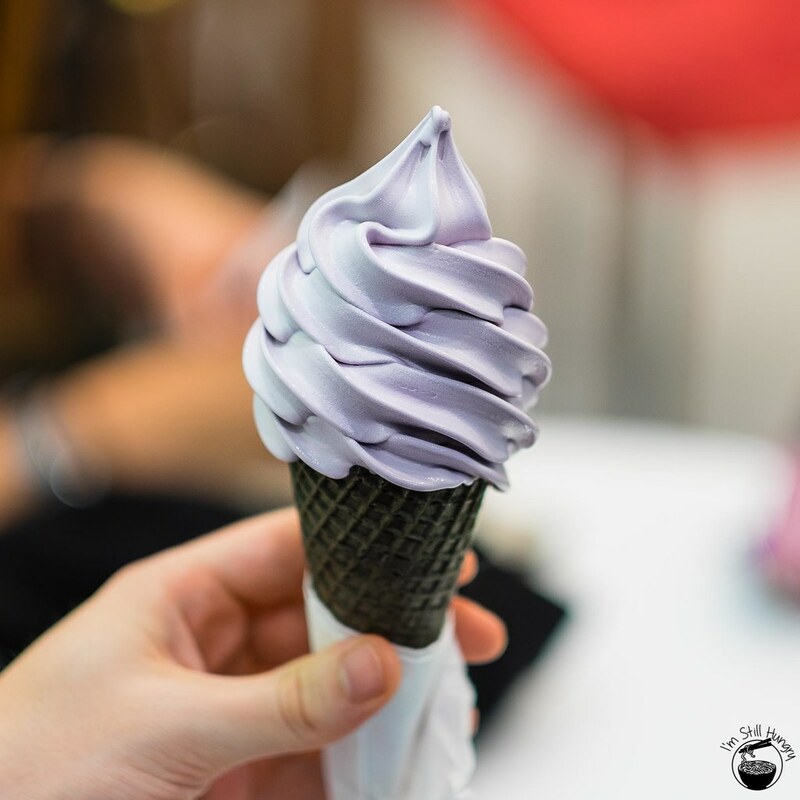 The taro flavour is a winner whether by itself, or mixed with sea salt. Have it whichever way you like it – you can’t go wrong. I’ve always thought that Aqua S is a bit like N2 Extreme Gelato. 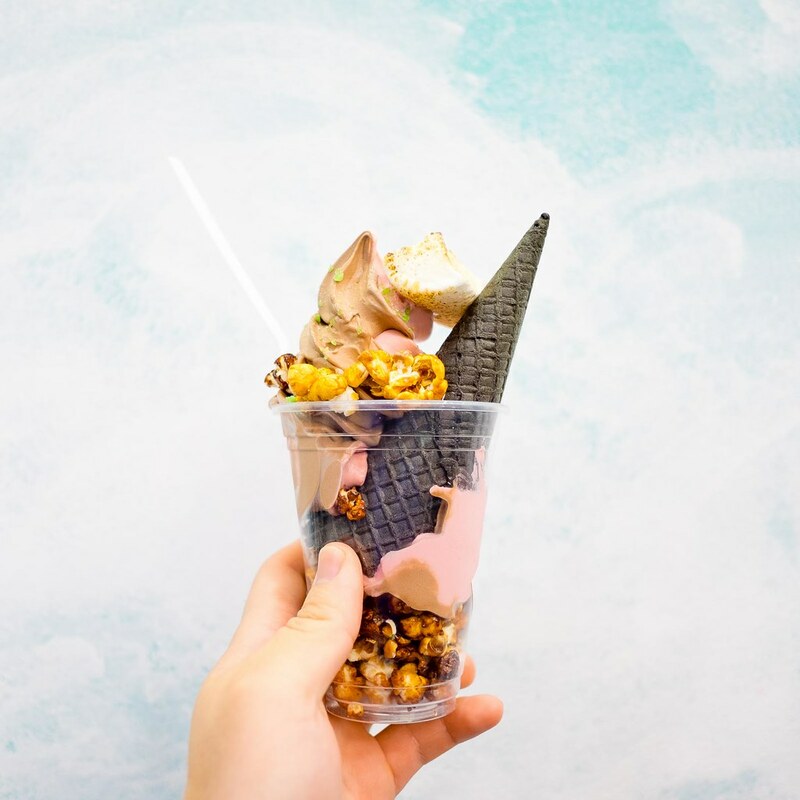 Both ice cream parlours experiment and release new flavours all the time, and the result is inevitably failures mixed in with winners. Well, Aqua S is on a winner for this round, I’m giving it another 0.5 caesars for that. It deserves it. Now, when’s my Chanoma-competing green tea flavour coming? For first time readers, I suggest scrolling down and start reading from the “Original Post” heading. Context is everything, ladies and gentlemen! Why not sea salt x strawberry cheesecake? Before we jump the gun, let’s see how the new flavours taste, yeah? For cheesecake lovers, the strawberry cheesecake will do a decent job of satisfying your cravings. It’s not as good as I imagined it to be in my head – being a bit more sour, and froyo-like in actual tasting. That said, its nature does make for a more refreshing soft serve. The cheesecake element does mean that you can’t eat it forever – it will eventually get too rich, and you’ll want to ditch. I’d tread carefully if you’re looking to order a large portion. As for the cocoa fans, salted dark chocolate tastes like…salted dark chocolate. That it’s so unsurprising is really a good thing – there are no nasty shocks here. Indeed, it’s a somewhat straightforward flavour, but that Aqua S didn’t have a basic chocolate flavour is something that’s finally remedied. For those who swear by chocolate, Aqua S becomes viable for the next two weeks! Personally? I’m ok with it – I prefer the original sea salt flavour, as chocolate just isn’t completely up my alley. Or to pop the rocks off your socks! But what of the combinations? Sea salt x salted dark chocolate is a bit strange – it’s literally doubling on the salt. Sea salt and lemon tea (or biscotti) works as the second flavour serves as a foil to the first. In this case, you’re talking sea salt with…more salt, and chocolate. It’s not the greatest combination, that’s for sure. I had to try it to find out though! Food blogger pains? Haha. As for the strawberry cheesecake x salted dark chocolate combo, more unity is found. There’s a bit of complementarity going on, which is more attuned to my palate. I get a bit of cheesiness and sourness, which is then enveloped by a salty tang and the distinctiveness of chocolate. That said, the overall combo is still of two heavy-ish flavours, which will get depressing after awhile. This second update to Aqua S has been a welcome departure, but I personally preferred the original two flavours – biscotti is a safe but delicious flavour, while the lemon tea was a very daring venture into super-sour territory, ultimate succeeding on the back of the sea salt flavour. Let’s see what’s coming up in the next iteration – can I get my matcha now? As of 3/2/15, the biscotti and lemon tea flavours are no longer available, replaced by two new flavours – this post will be updated within this week to include my thoughts on the new flavours. Expect the same level of detail! 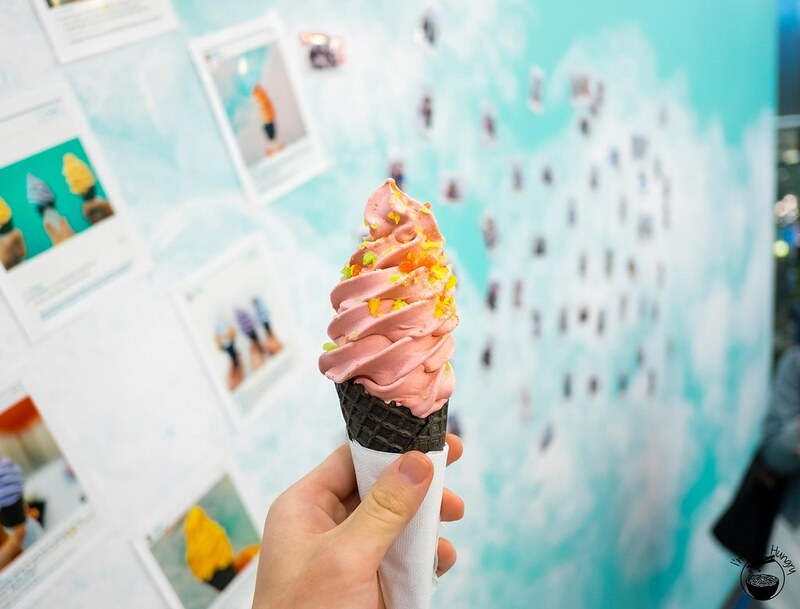 Like its signature product, the Aqua S Parlour storefront is all blue skies with a prodigious chance of clouds and much soft serve. Overall, it’s a well-lit, very welcomingly gay place. 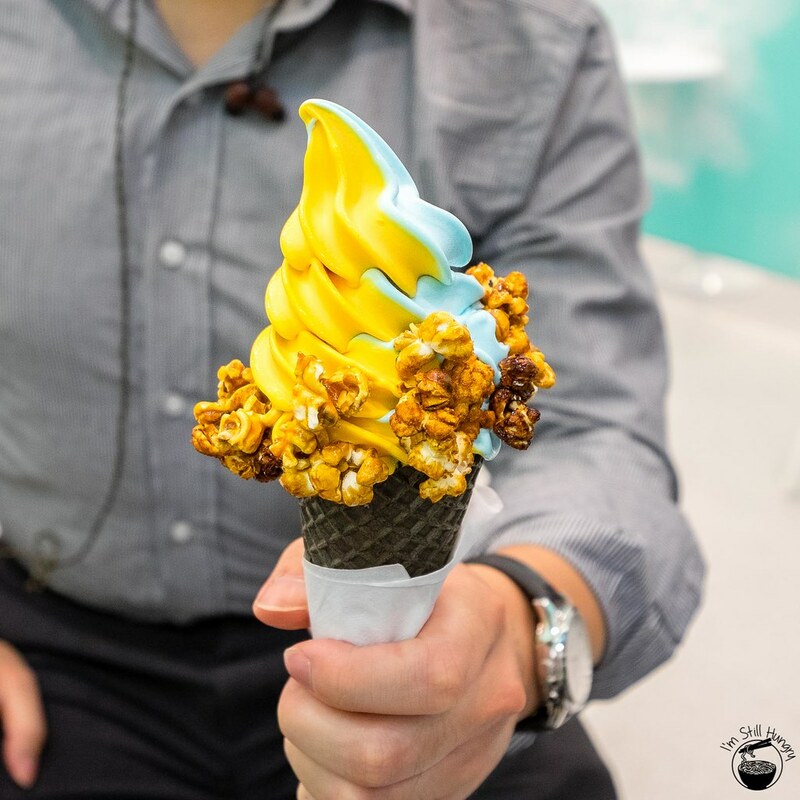 Aqua S’ soft serves have increased in size since my first visit four days after their opening. You can tell – the pictures near the end have bigger serving sizes than the first few pictures (such as the above). Feedback seems to be taken seriously here! 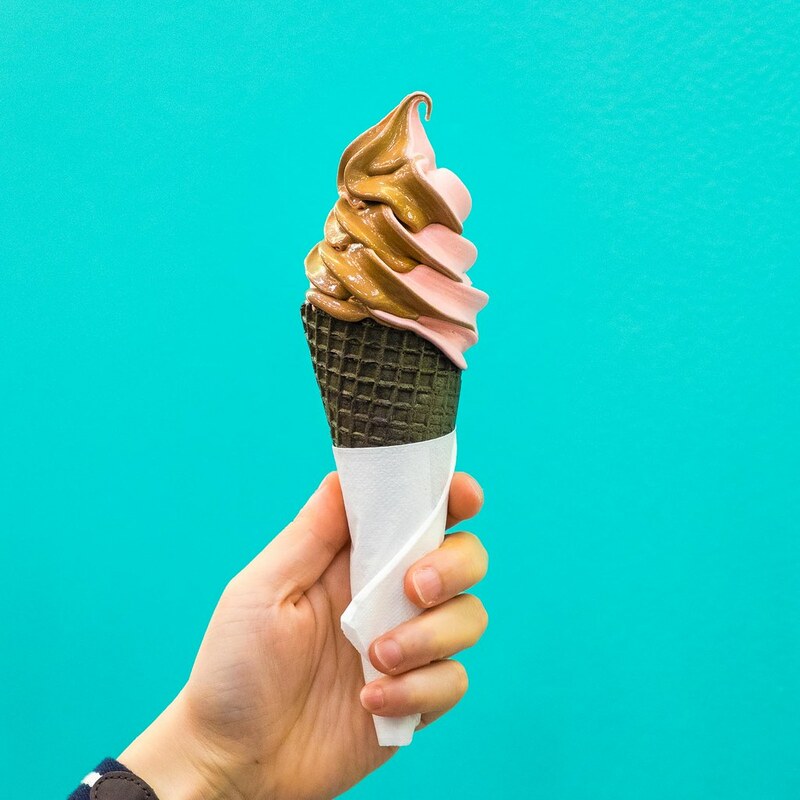 A serve of…soft serve will cost $3.8 in a dark chocolate cone (it doesn’t actually taste much like dark chocolate, just saying) or small cup; or $4.3 for a large cup. One topping will cost $1.5 on top of the base price, two toppings $2.5, and all 3+ is $8. 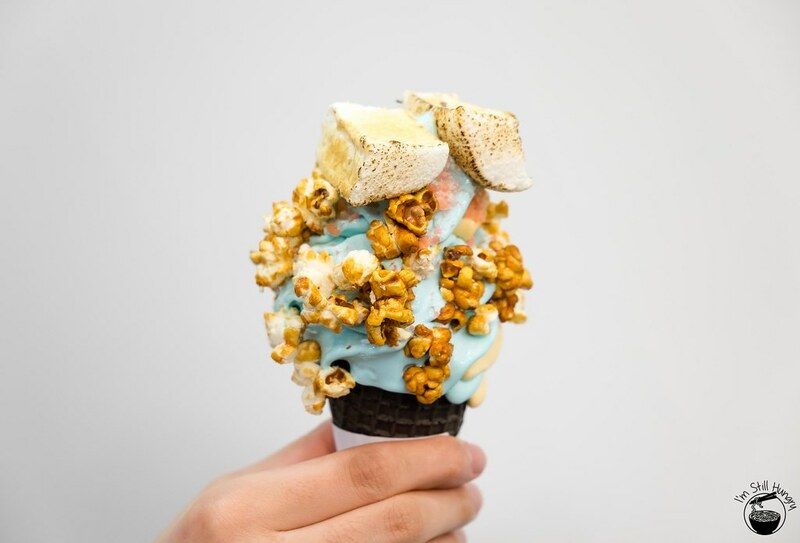 The toppings are currently limited to caramel popcorn, popping candy, fairy floss & toasted marshmallow. There’s no escaping it – the toppings are quite expensive. 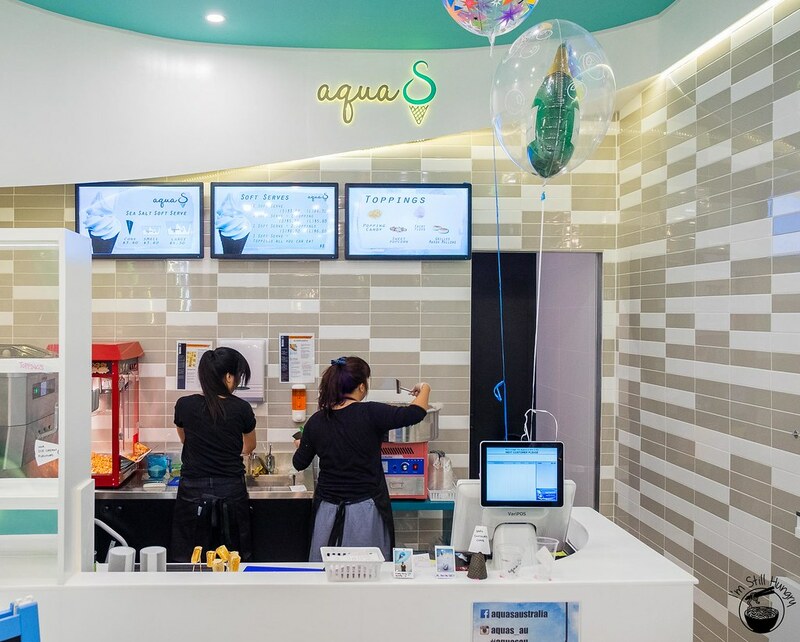 But then again, from the recent explosion (and even more recent collapse) of the froyo craze, where toppings were on the order of double-digit cents, Aqua S’ toppings would indeed seem like a bit of a hard sell. In the end, you must decide on the value proposition. For an example comparison, Messina’s Dessert Bar features two gelatos of your choice plus three toppings for $9.9. 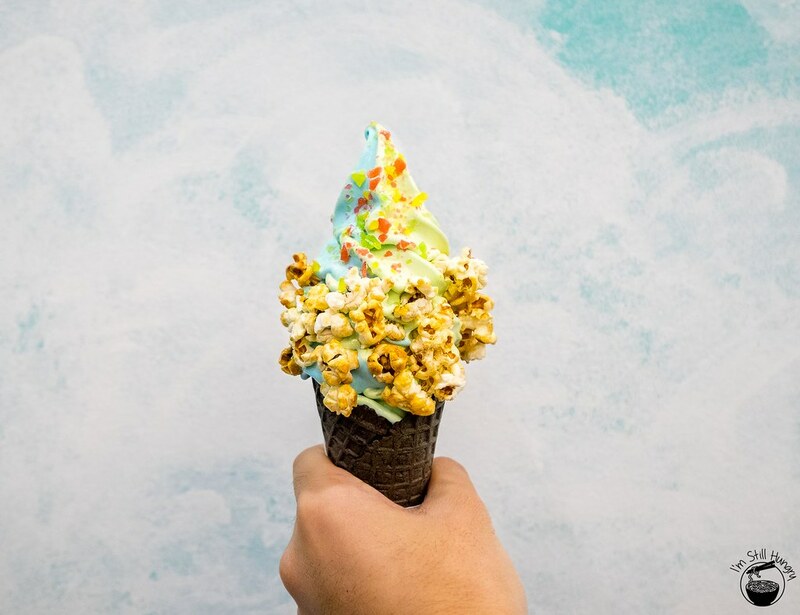 At Aqua S, either the small or large soft serves with all (four) toppings will run you $8. And yes, you can combine (twist) any two flavours together. 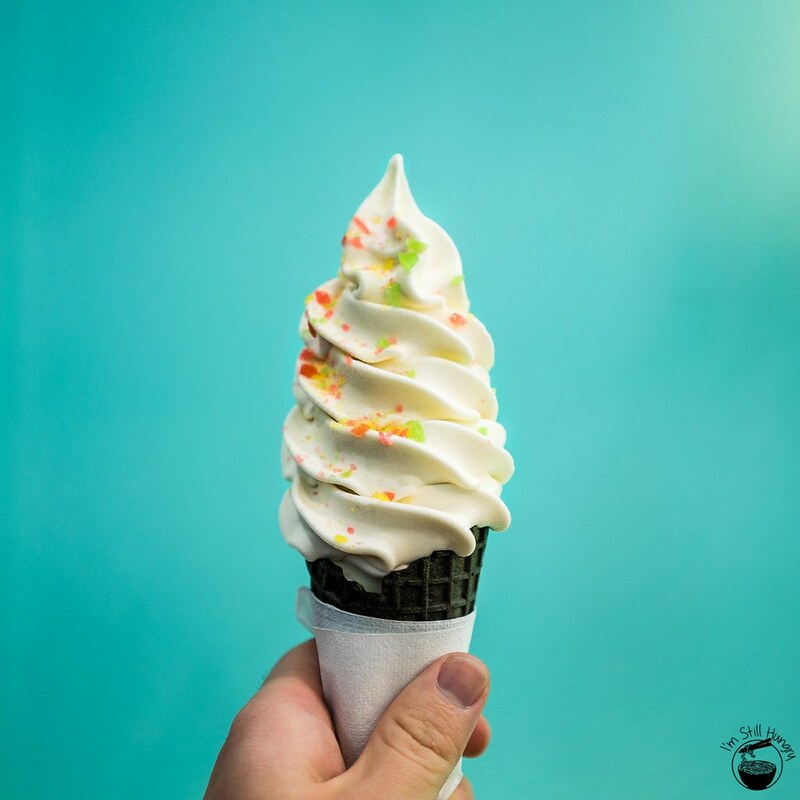 But then, that would mean that the soft serve actually has to taste good, given that’s what you’re really here for. Right? Co-owner Jennifer Lam has definitely staked a fair bit on Aqua S’ signature product. 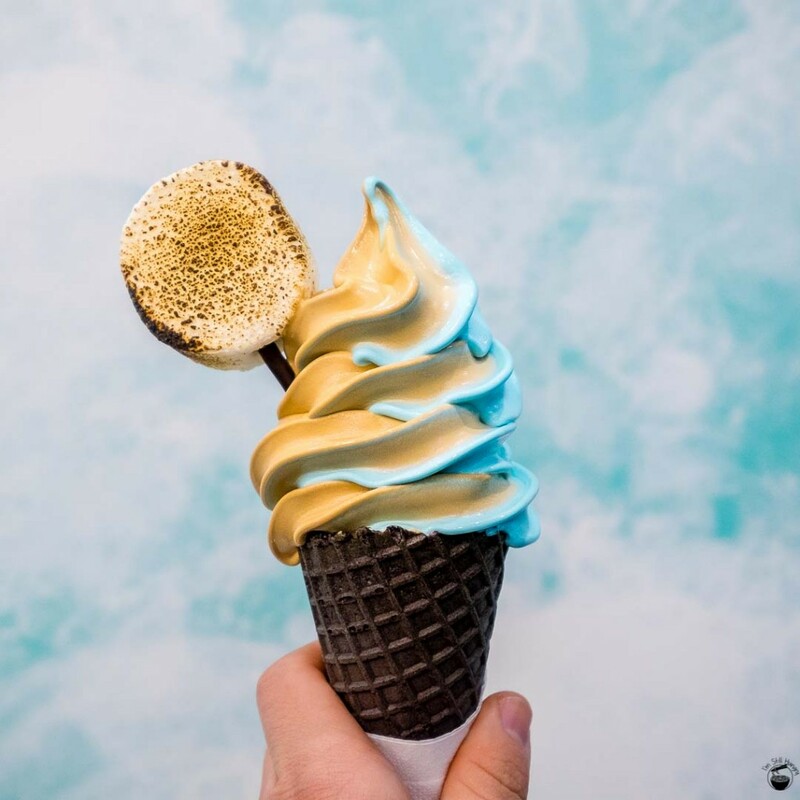 Sea salt soft serve. There’s no misdirection here – the name does an accurate job of describing the product. This flavour will also never go off the menu, rest assured. And yes, the humble I’m Still Hungry opinion? It’s good! I’ve always exhibited partiality towards ice creams that have a bit of a savoury edge. Evidently, the masses would find some level of agreement – hello Messina, hello salted caramel! 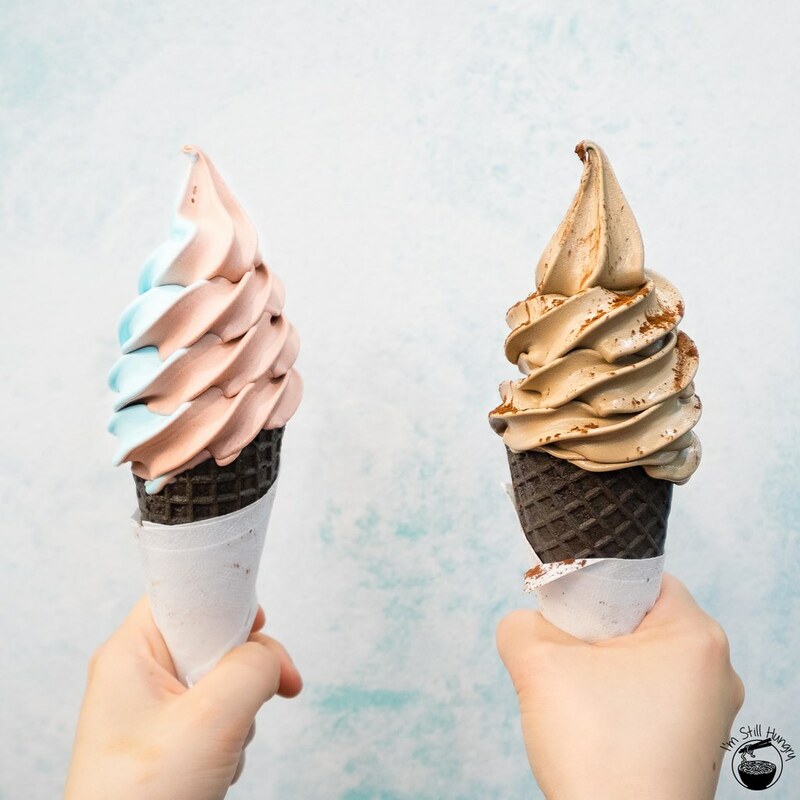 Soft serve has a higher percentage of air within its volume than ice cream or gelato, thus giving it a lighter texture, which is far creamier than ice cream. 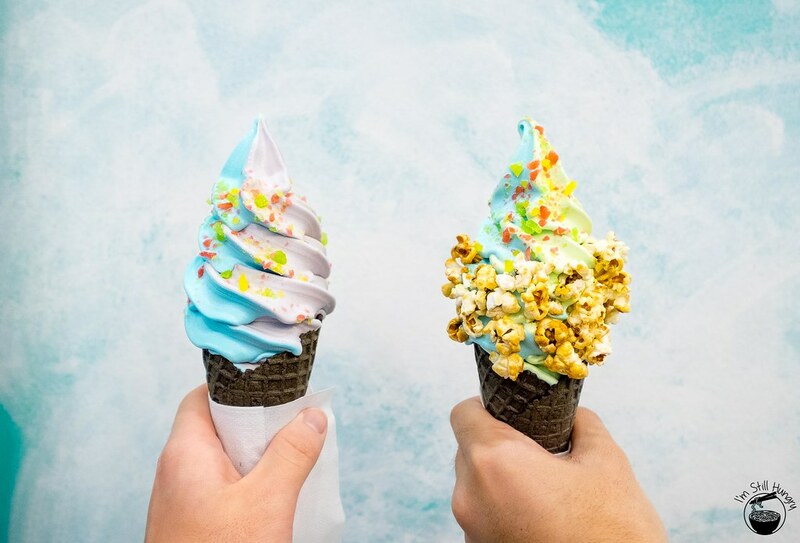 If it’s done right, it will also not taste particularly icy, which is a negative aspect of soft serves. 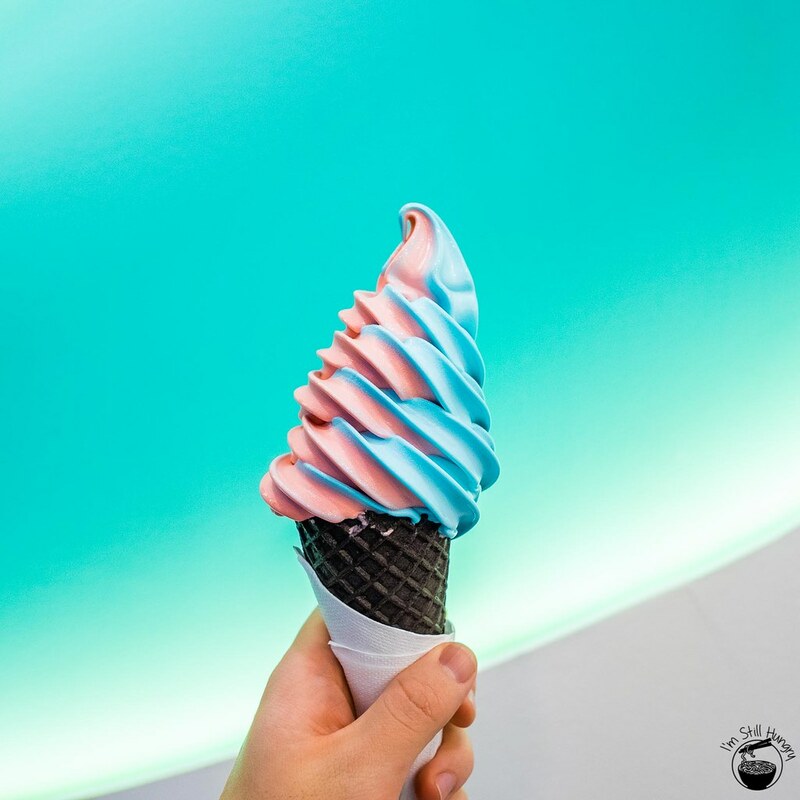 Aqua S’ is pretty much all creamy goodness, virtually no iciness – great stuff.Like all soft serves though, the inherent weakness is that it melts a fair bit faster than most gelato or ice creams. The phrase “consume immediately” applies with force here. Sea salt lacks the butteriness and that slight beurre brûlé kind of a taste that is the hallmark of salted caramel. That said, it lacks the heaviness of salted caramel, which in some cases is to the disadvantage of salted caramel. Aqua S’ sea salt flavour is very clean, and refreshing to eat. I love salted caramel as much as anybody, but I would never call it a “revitalising” flavour. Aqua S’ is.Maybe it’s merely knowing the fact that it’s sea salt, but I could swear I could almost taste a slight brininess to the soft serve. This makes absolute sense – it is sea salt, after all. 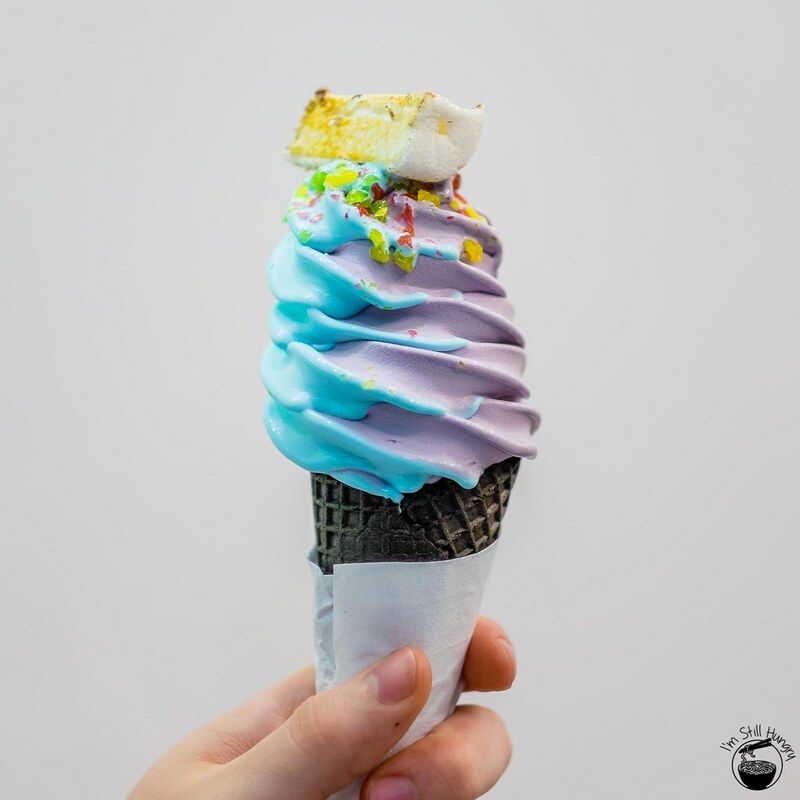 Combine these two aspects of flavour and texture, and you get a soft serve that works unsurprisingly well on many levels. I almost fully expected to enjoy it – lo and behold, I enjoyed it three times in different forms. Don’t let me oversell you – this flavour is not for everyone. Some have said that the saltiness is too much for them, some have said it gets boring very quickly, and some simply prefer Messina. Is it worth a try though? Hell yes. I must say, even I would not get the signature sea salt flavour just by itself – I’ve always twisted it with another flavour, and this I believe, is key to countering the “boredom factor”. The first time I had it was with biscotti, which in itself is a flavour so enjoyable it’s worth having by itself. The Italians really were on something when they invented biscotti, that’s for sure. If you can’t stand sea salt, biscotti will be your backup. [Added 3/2/15] They might bring back this flavour – it has been quite popular. Ah yes, that’s right – the flavours are said to rotate every few weeks (bar the sea salt flavour). I’ve yet to see it happen as the store is so new, but I suspect it will be soon! [Added 3/2/15] Indeed, two new flavours have now made their debut! Stay tuned for my debut update! 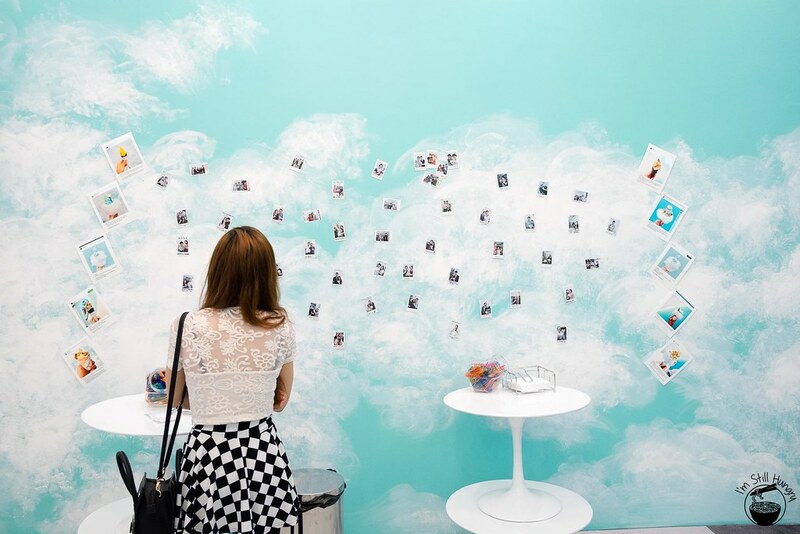 A Polaroid/Instagram wall. The early go-getters get their pic on the wall first! The second time I had Aqua S was the sea salt with lemon tea flavour. This is not a flavour I recommend getting by itself, unless you’re really into citrusy soft serves. They use a lot of lemons and a lot of tea. Brace yourselves. But what about the toppings? My verdict – the caramel popcorn & popping candy are highly recommended. 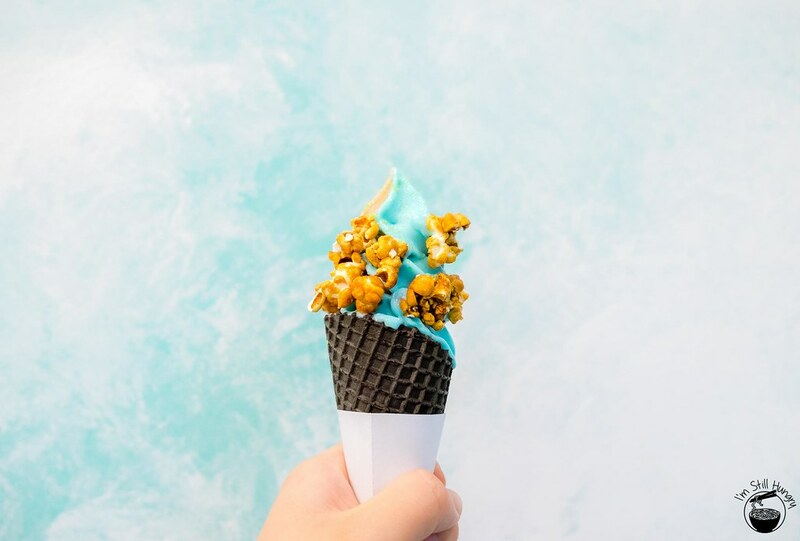 Caramel popcorn should almost be self-explanatory, and popping candy adds an underrated fun element to one’s consumption. The popping sensations in the mouth are delightful! 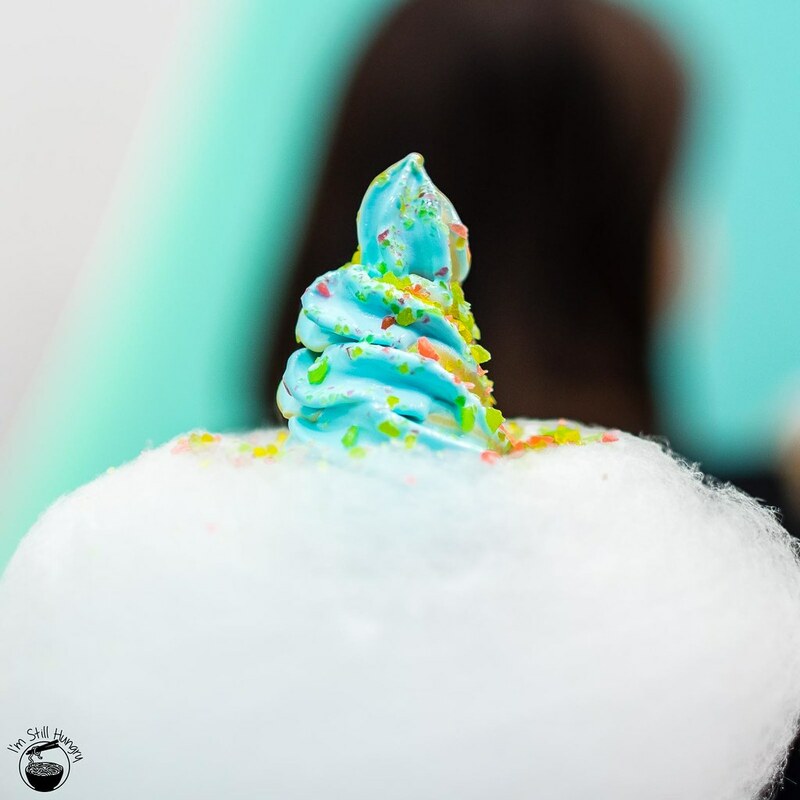 As for the fairy floss…well let’s just say that I’m not the only one to purchase this topping just to make a heaven-genic picture :P. Same with the toasted marshmallows. So I quite like Aqua S – I think it’s good enough not to be a gimmick, and despite the flavours being somewhat weak by themselves, work beautifully when melded together. The inclusion of toppings is quite fun as well, even if some of it is superfluous. But then again, should you really take this place too seriously? 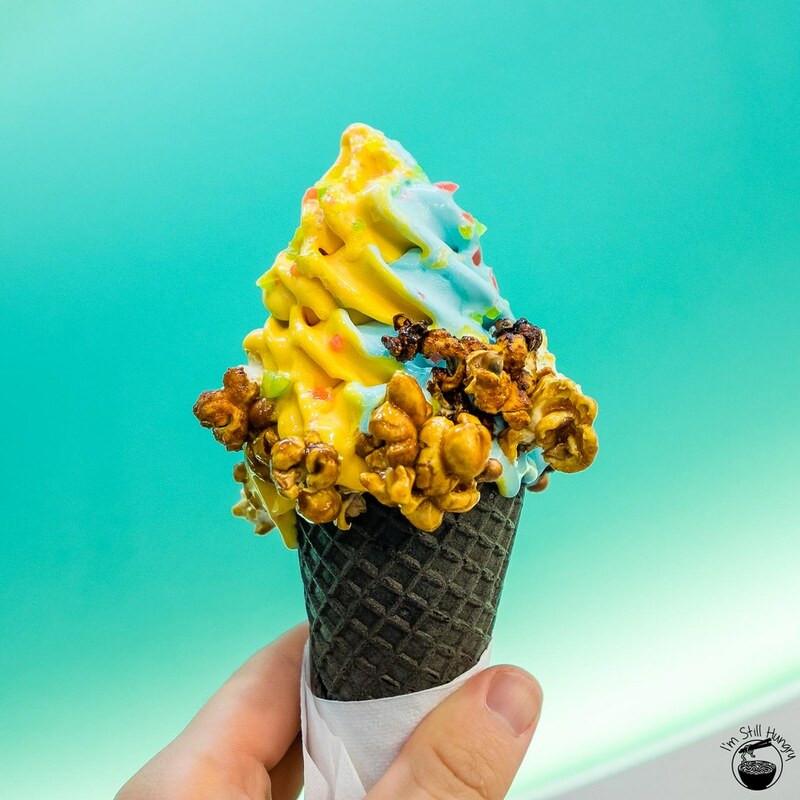 All content in this post is based on independent visits to Aqua S.
You’ve probably already visited Aqua S, dear reader – tell me, what did you think of it? What flavours do you want to see next? Who knows, they might just take heed! [02/04/15] Tofu is delicious. Nuff said. 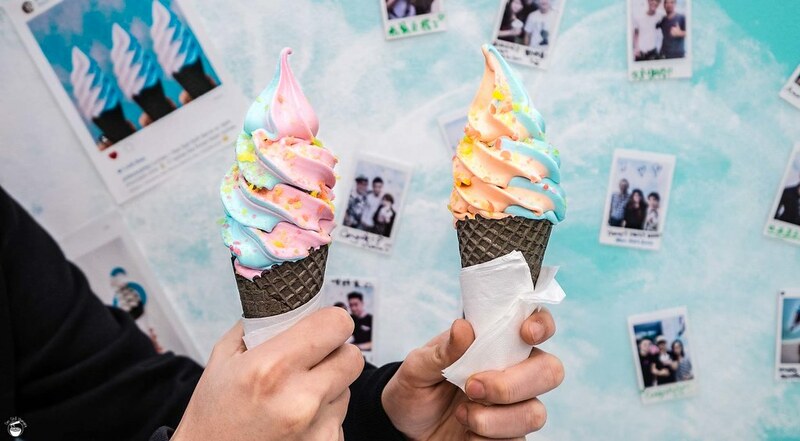 [21/3/15] Pink twins are a return to deliciousness and good looks! [14/5/15] Depending on the staff that serves you, your service may be quite slow. [30/4/15] Pink grapefruit’s appeal is going to be limited to those who like the astringency of grapefruit. What a brilliant mess it is to eat! Grab plenty of tissues! Did you end up trying Strawberry Milkshake or English Breakfast? Wasn’t terribly impressed by Strawberry Milkshake and I didn’t get a chance to try English Breakfast. Yep, tried both! They’re fairly safe flavours, but delicious so I’ll give them that. Honey cream & Guava this time around! 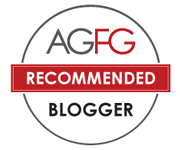 Just saw the new Aqua S flavour update and rushed over to your blog to see if it was reviewed. So glad you did! I’m going to need to add an RSS for this post or something. I was wondering if they would go safer with the pumpkin and add some spices for an American pumpkin pie flavour, but from your description it’s really just pure pumpkin soup… would I be right? Really intrigued. Also, should I blend it with sea salt or go pure pumpkin? Now that’s fast turnover, glad I made the cutoff! There was only the subtlest hint of spiciness, but for all intents and purposes it may as well not have been there. It’s definitely more a pumpkin soup, as opposed to a pumpkin pie, as what the flavour’s name states. I’ve been getting mixed reports on blending it with salt or not – I personally would not blend it with the salt, but you’re probably not going too far off if you did. Agreeing with you with the salt blend. I tried it both ways and it was much more interesting by itself. Didn’t see many people ordering the pumpkin this weekend, but I can imagine it making a comeback as a Halloween flavour, like you said! Like a true pumpkin soup, it needs no addition (well, maybe except bread haha). Chiming in to say that I love your Aqua S updates. Please keep it up! Caramello and Green Apple are okay but much preferred Milo from the week before. And I’m devastated I missed tofu so Aqua S definitely needs to do this poll! Thanks Ingrid! I’ll try my best – new updates to come tomorrow! Your comments on Green Apple/Caramello is pretty much exactly what I thought of the two flavours as well. I wonder what tomorrow will bring? Yeah I noticed the marshmallow’s changed as well! They prop it up on a stick of Pocky now. Not a bad move – when you think about it, the marshmallow, like any other topping is $1.5. For a single marshmallow. This is a bit better. Just noticed your cute little editor’s button! And Aqua S this week hmmm.. Not a big fan of fruit flavours to be honest. Hope they bring something heavy back in two weeks. God, I feel like I have to get back on the treadmill just looking at the amount of Aqua S you have consumed wtf! Understandable though, as they’re really, really good and creamy! Totally worth all that creaminess though! Thanks! I’m glad that someone’s deriving utility from the running commentary. Definitely hope they do a “Aqua S highlight reel” – and taro had better be on there! Yes, do try it – within the next week! It’s not just a good idea, it’s a great idea! Raff full? How is this possible. Must’ve had two gumshara mega ramens that day, eh? Yeah so many people far out, but good on them for doing so well! They need to expand at this rate! I had the sea salt by itself and oh boy did i get sick of that really fast. I really want to try their new flavours or have a seasalt cone with another flavour. LOL all good, I was thinking it had to be one or the other, though bitter biscotti would definitely be a bit weird! 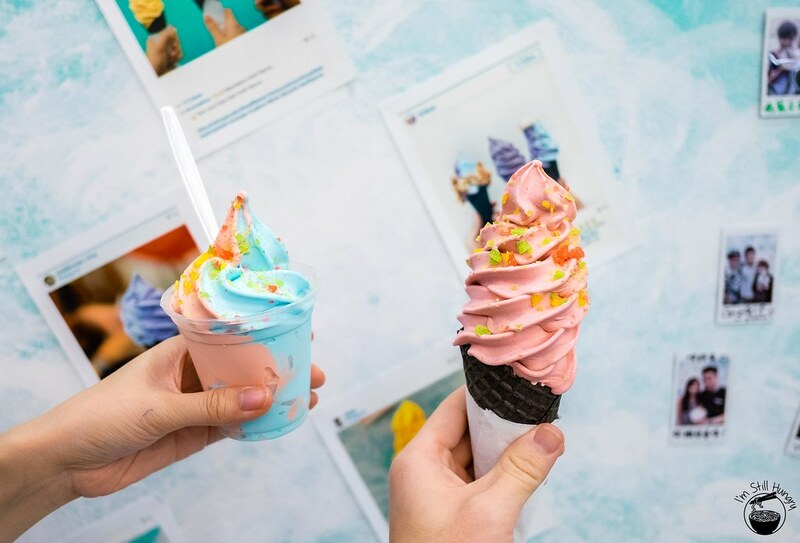 I think they might be clever and engage social for “what flavour(s) do you want to return” when they’ve gone through several flavour release cycles. Thanks for the kind words, will keep this post updated with new flavours that I’ll be having this week! I never had any flavour by itself, so I think for me the negatives of any individual flavour (saltiness of the sea salt, sourness of the lemon tea, or in your case the biscotti’s bitter/butter(?)) never really shone through, and only positives remained. I guess the point is slightly moot – biscotti & lemon tea are no longer on the menu. Should be interesting to see what the strawberry cheesecake + salted chocolate bring! hehe i liked the lemon tea flavour but im super keen to try the new strawberry cheesecake flavour! Yes, me too! 4th visit, here I come!